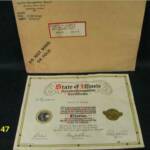 WW2 Illinois Certificate: Awarded in 1947 for Service Recognition during WWII by the State of Illinois. 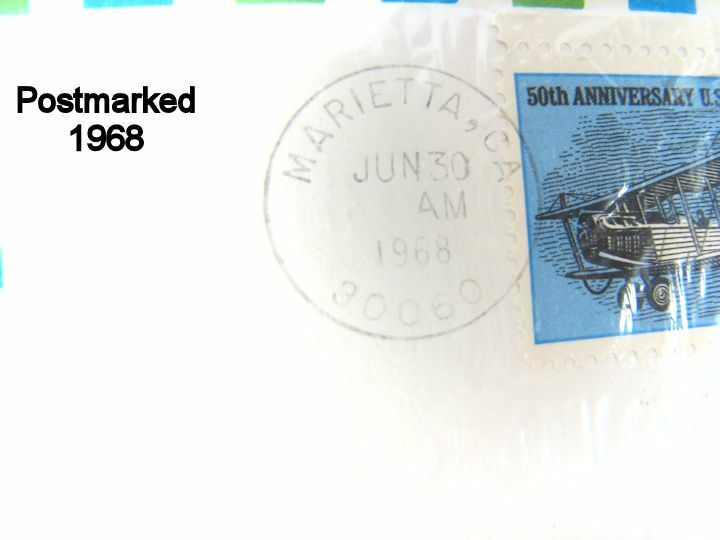 Has the mailing envelope with it. No tears or folds on the Certificate. 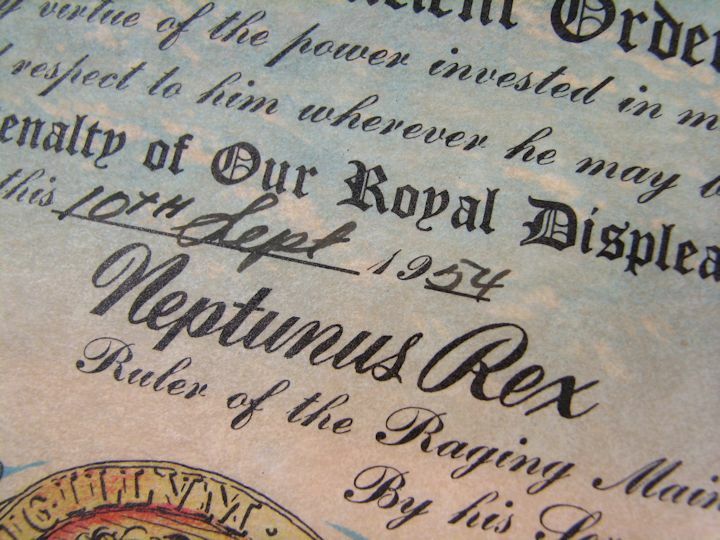 Robert Turpin. 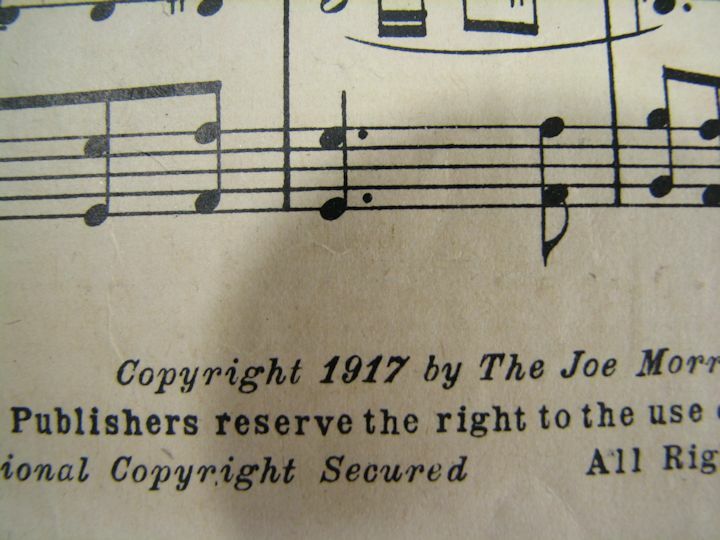 Copyright 1939. 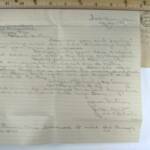 Written by a US Navy Lt. Comdr. 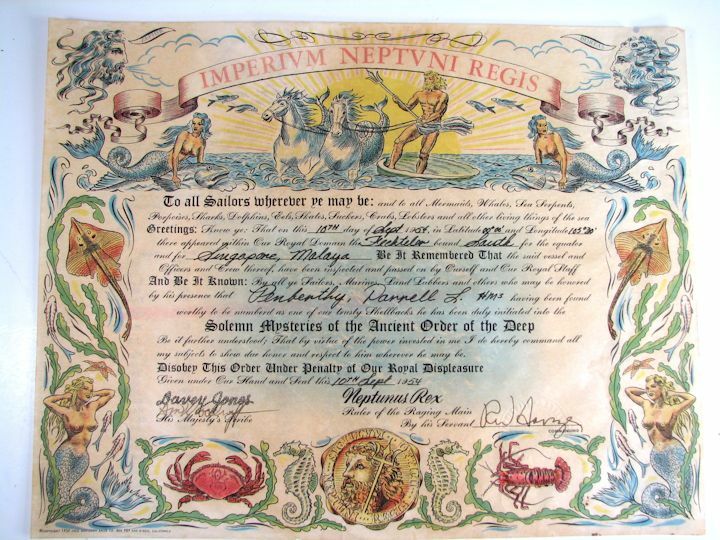 who donated his royalties to the NAVY RELIEF. Nice condition with no major rips or tears. 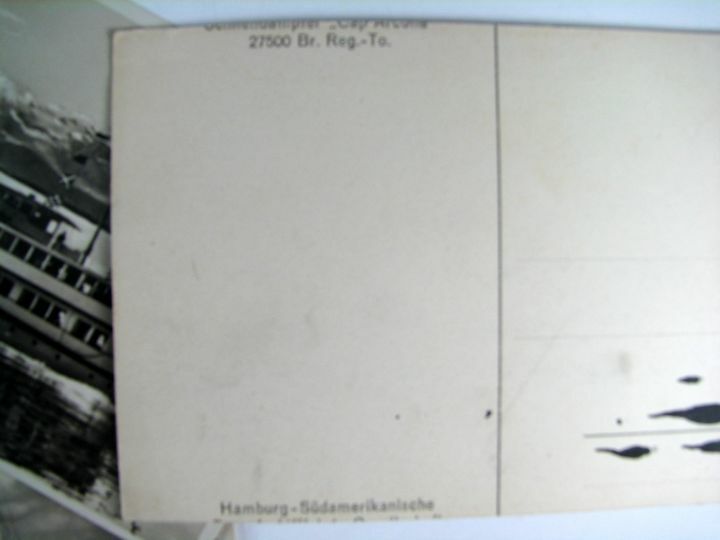 Image is of a Battleship. 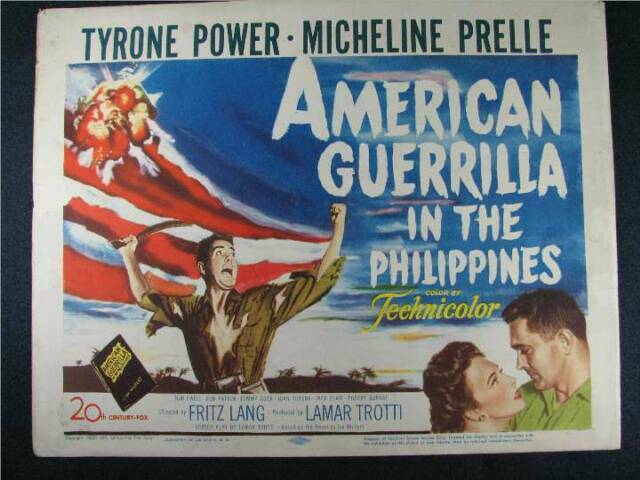 AMERICAN GUERRILLA in the PHILIPPINES: 1950 Theater Lobby Poster for the movie. 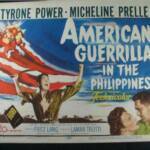 Features Tyrone Power swinging a Philippine Barong. Size is 11" X 14". Lots of edge damage from tape and tacks with edge wear and corner bending. Still would look nice framed and in your man cave. TO THE SHORES OF TRIPOLI: 1952 Theater Lobby Poster for the movie. 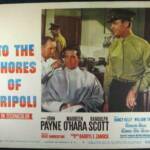 Features Randolph Scott in uniform and carrying a swagger stick. Size is 11" X 14". 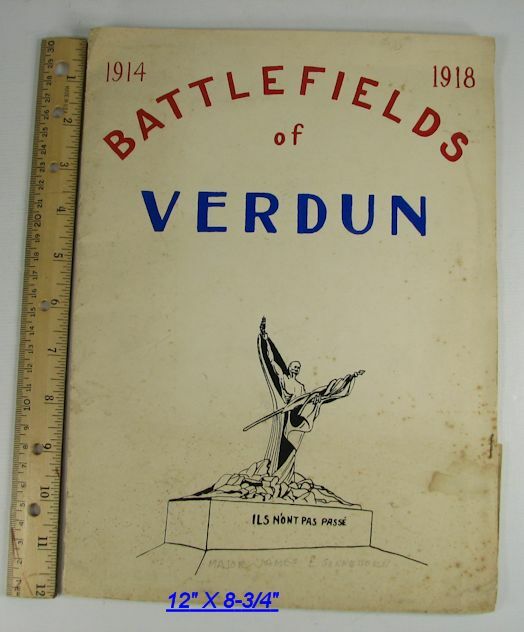 Condition is pretty good with some edge wear and corner bending.. Will look nice framed in your USMC room. 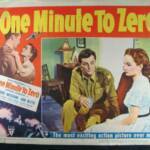 ONE MINUTE TO ZERO: 1952 Theater Lobby Poster for the movie. 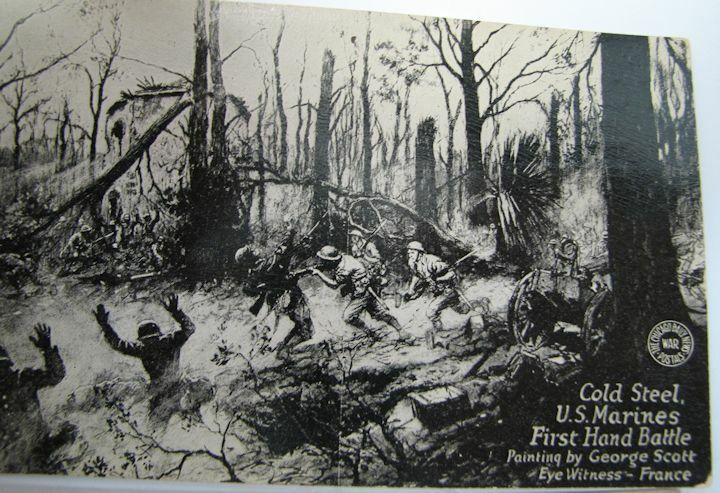 Features Robert Mitchum in an 8th Army uniform. Size is 11" X 14" and has lots of edge damage and some tears. 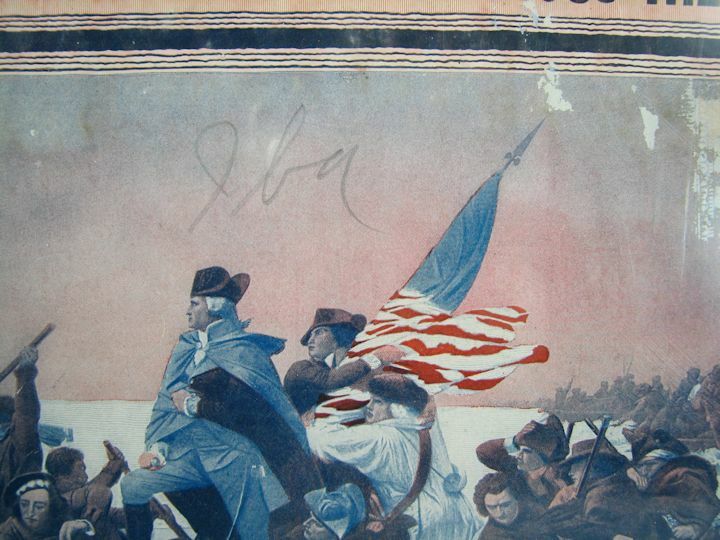 Still would look neat framed, with a 8th Army uniform collection. 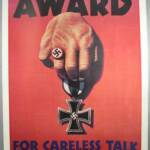 My research has found that this was a World War II Period "AWARD For Careless Talk" Home Front War Work Propaganda Poster. 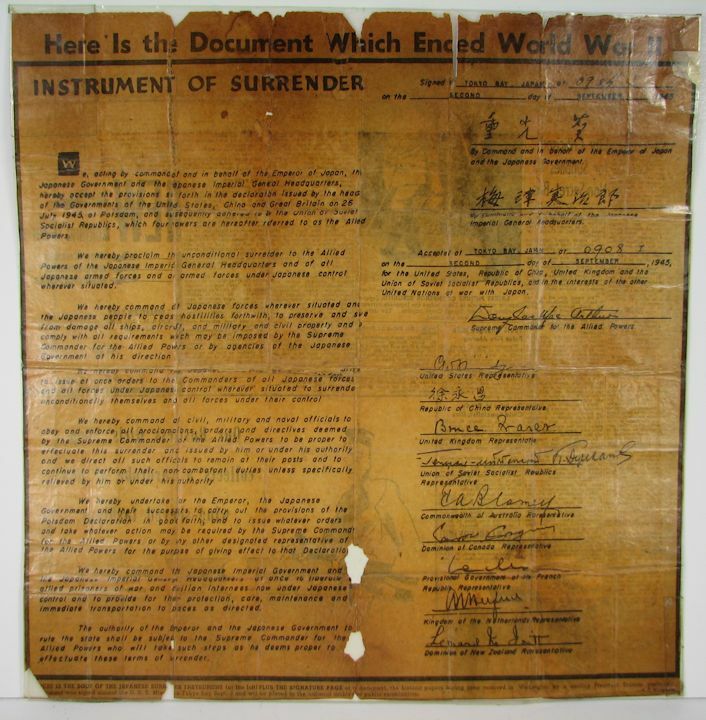 It was an early war US printed (under War Department contract) poster featuring an Iron Cross. 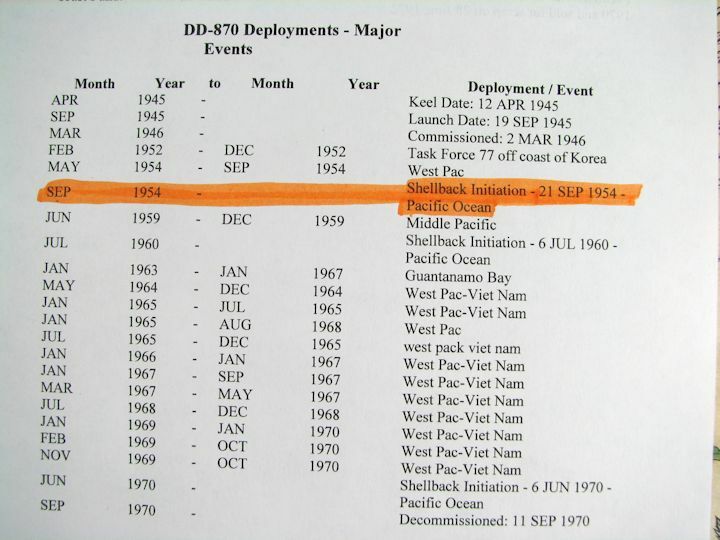 It was issued by the Office of War Information as one of a series. The original artwork was by Stevan Dohanos. This reprint is very good overall; no pin holes, creases, folds, tears etc, just minor wrinkles all in the margin. 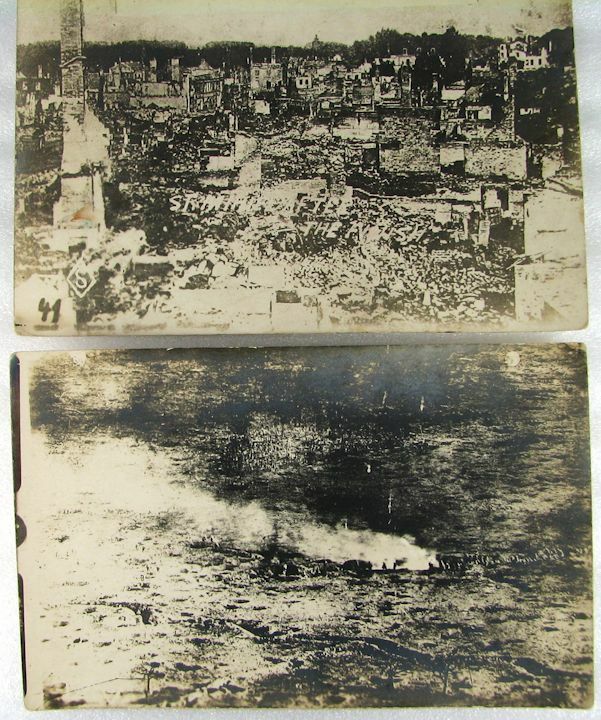 It is printed on very heavy stock and measures 18 1/4" X 24 1/2" in size. I will ship this rolled. Note: This is a reproduction. 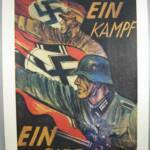 My research has found that this was a World War II Period Home Front War Work Propaganda Poster. 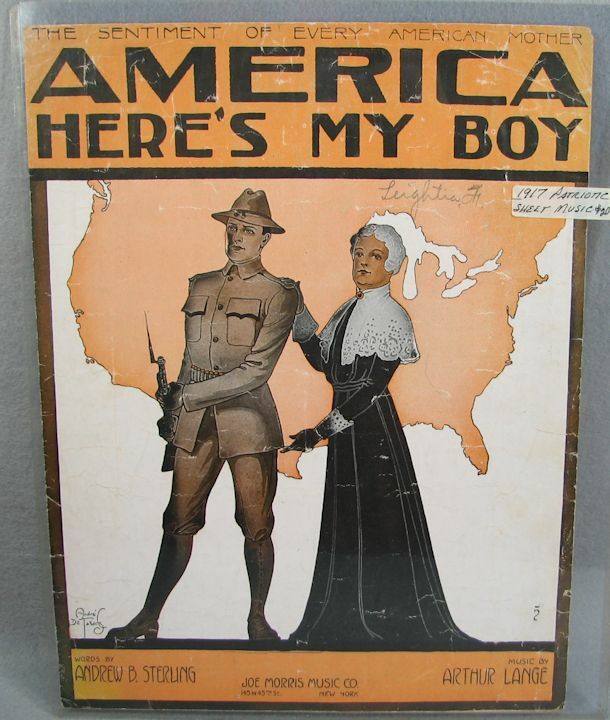 It was an early war US printed (under War Department contract) poster. 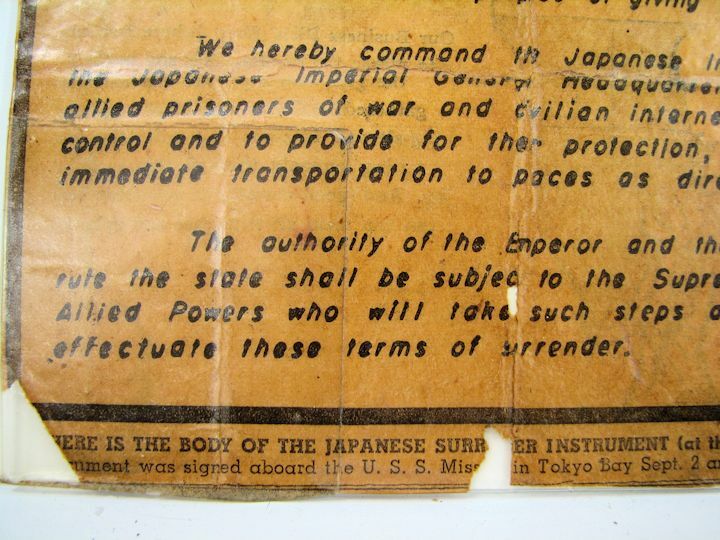 It was issued by the Office of War Information as one of a series. 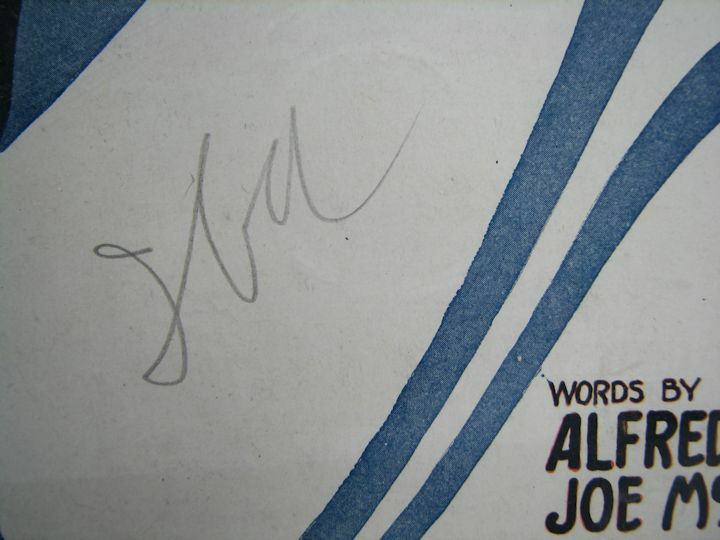 This reprint is very good overall; just minor foxing and handling wear, all in the margins. 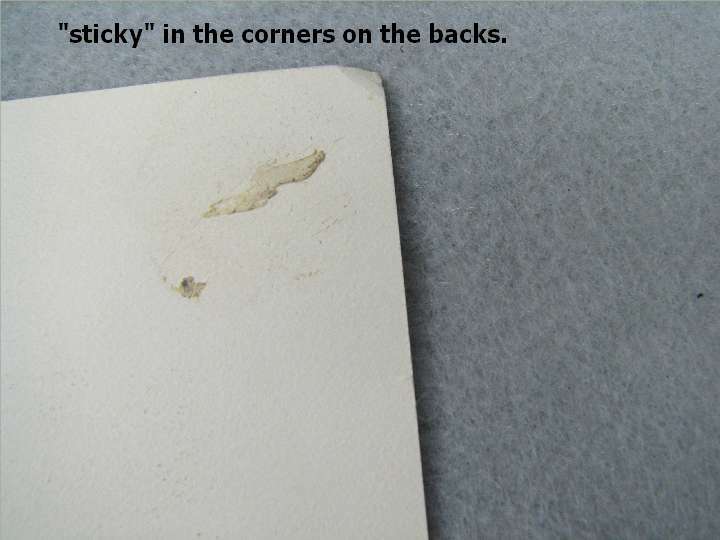 Sticky stuff on the back corners (see photos). 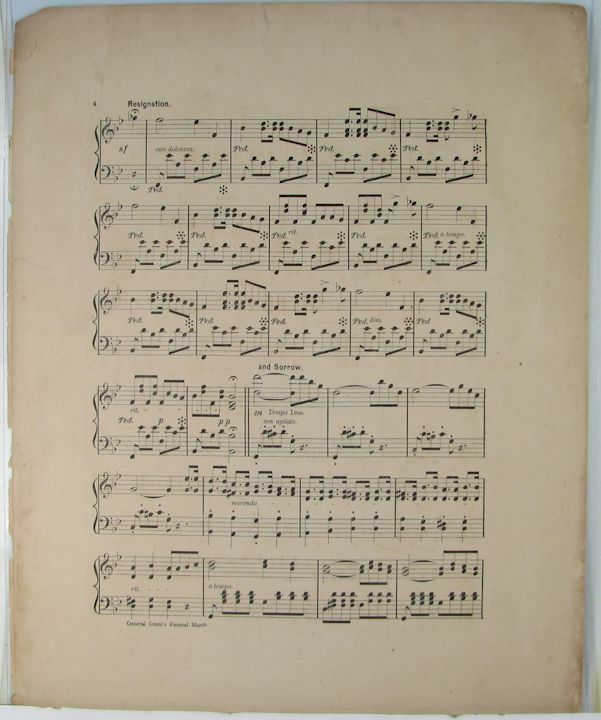 It is printed on very heavy stock and measures 18 1/4" X 24 1/2" in size. I will ship this rolled. Note: This is a reproduction. 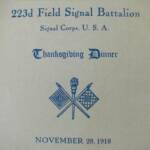 WW1 Thanksgiving Dinner Menu: The menu from November 28, 1918 for the 223d Field Signal Battalion. Stationed at Camp Meade, MD. 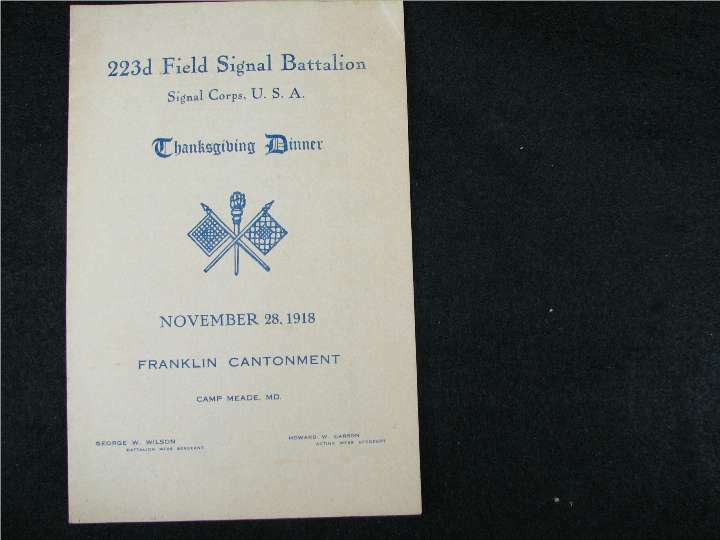 The Franklin Cantonment. 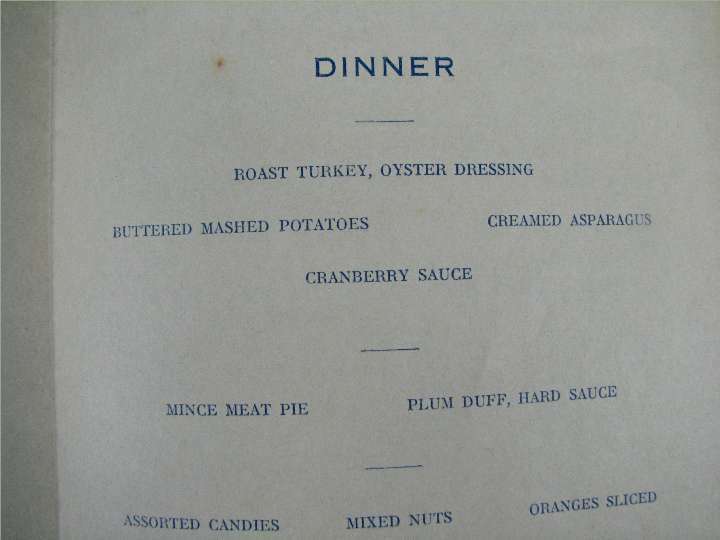 Sure sounds like a good meal. 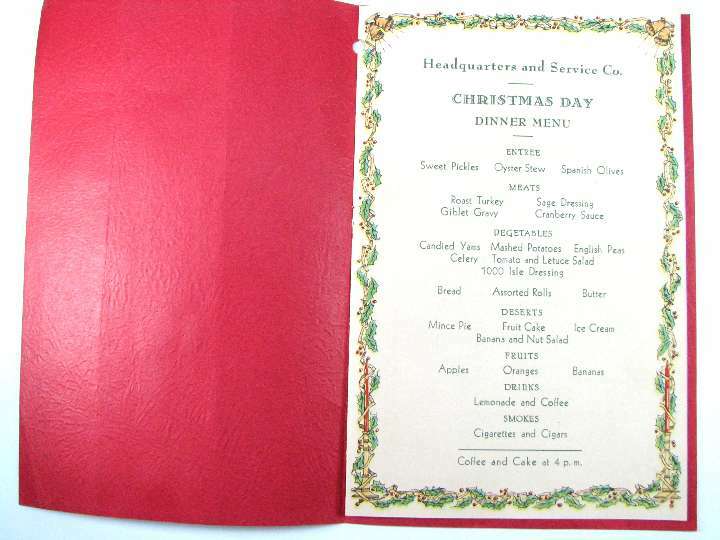 WW2 Christmas Dinner Menu for the 111th Engineers stationed at Camp Bowie, Texas in 1941. 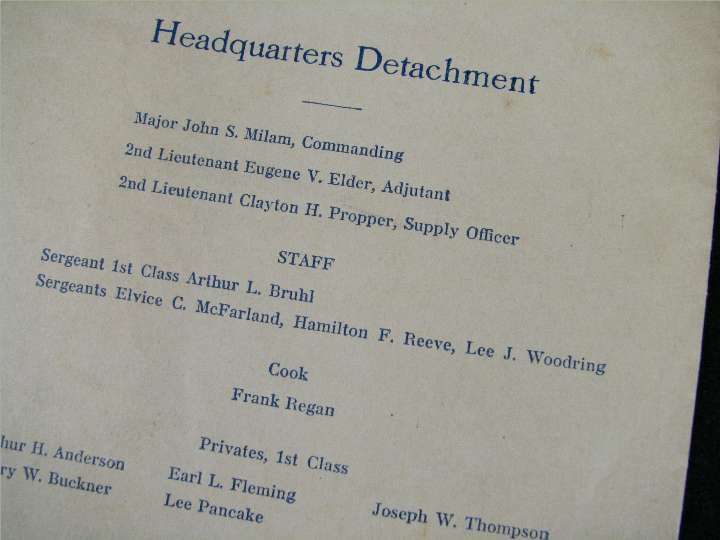 Includes the unit's Roster. 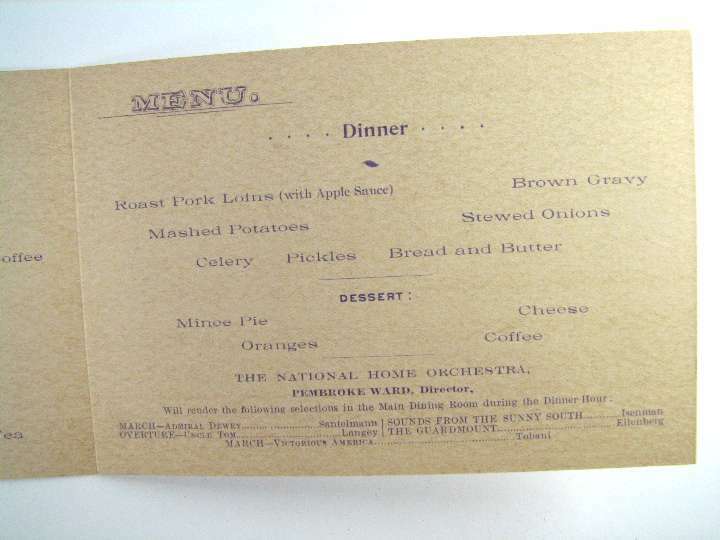 CHRISTMAS 1899 MENU: This menu is from December 25, 1899 and is what the Soldiers were fed at the North West Branch of the National Home for Disabled Volunteer Soldiers. 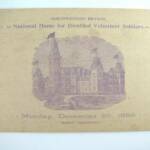 The residents in these National Homes were primarily Union Civil War Veterans and in 1899 a few Spanish American War Veterans. 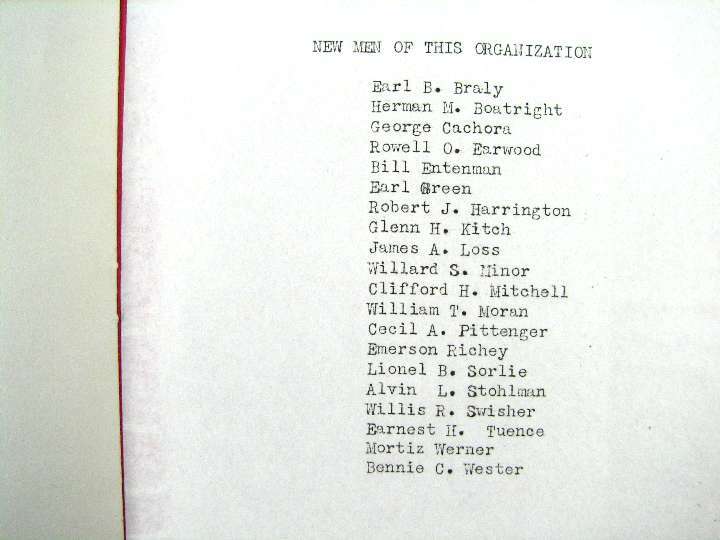 These homes were renamed when the Veteran's Administration (VA) was formed in the 1930's. 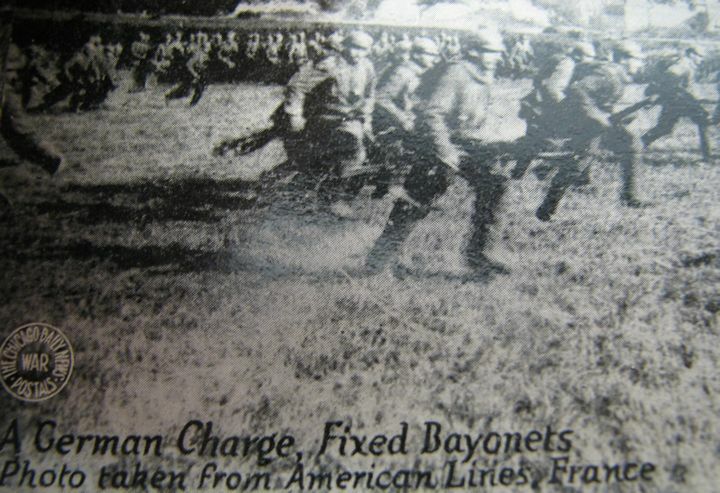 9th US Cavalry Buffalo Soldier, Ft. Riley, 1930. To his brother, a Doctor. Talks about leaving the Army. Famed Black Unit. 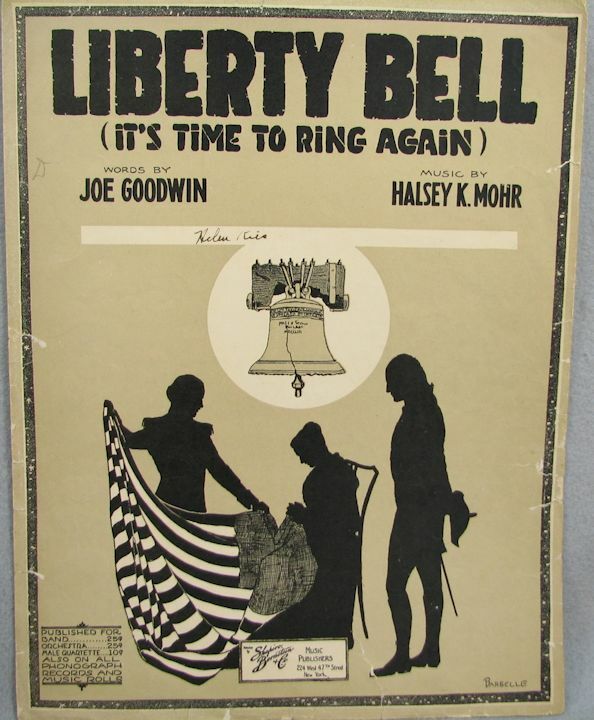 WW2 PATRIOTIC SHEET MUSIC/ART: There was some nice art work on the covers of these old sheet musics. They look good simply framed and hanging in your "Headquarters". "The Bombardier Song". 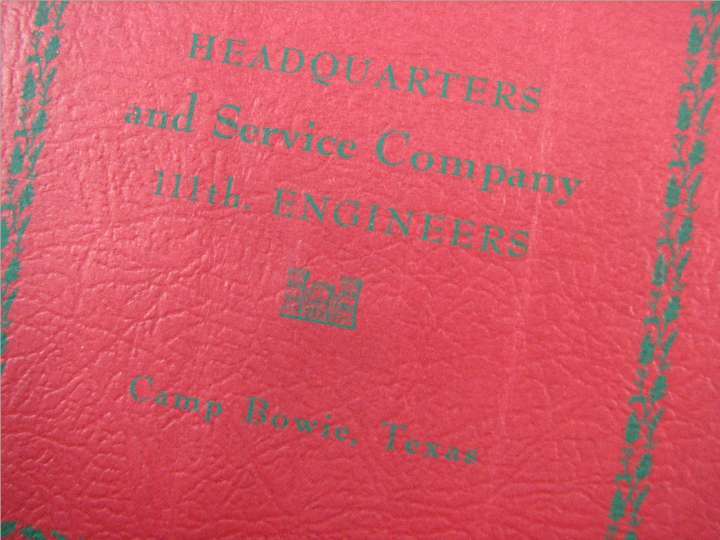 WW2 U.S. WAR SAVINGS BONDS: A 7" X 9 3/4" booklet of 13 pages with ads on both sides plus ads on the cover. 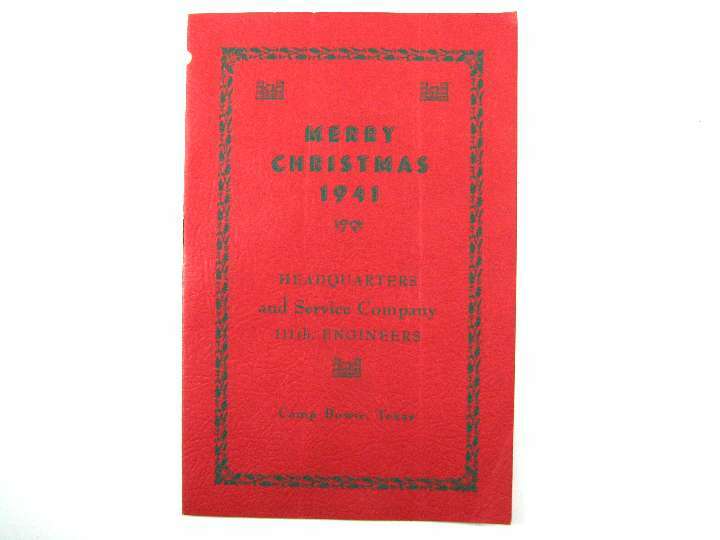 Featuring local Companies promoting the purchase of Savings Bonds to help the War effort. A few cartoons. Pevely Dairy; American Zinc, Lead and Smelting Co.; Alligator Rainwear; Sunnen Products; Fulton Iron Works; Forest Park Hotel; Frank Adam Electrical Products; International Shoe; Chase Hotel; Hess & Culbertson and many other ads. 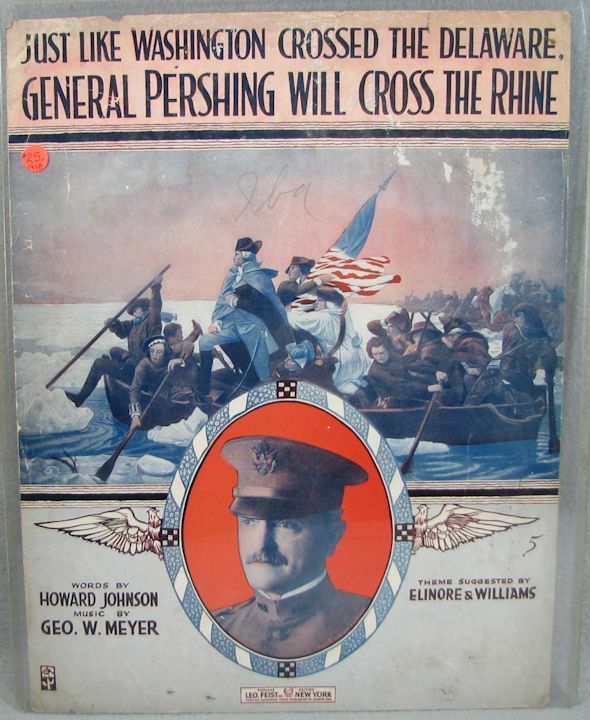 The program featured Irving Berlin's "This is the Army". and more music. It has been folded. 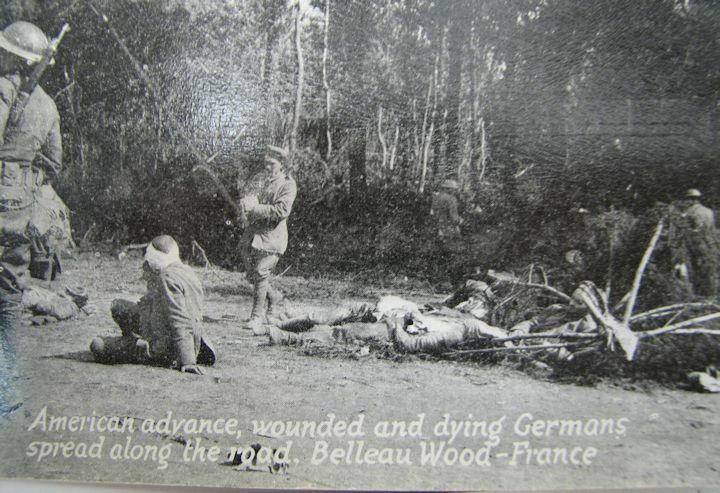 WWI A.E.F. 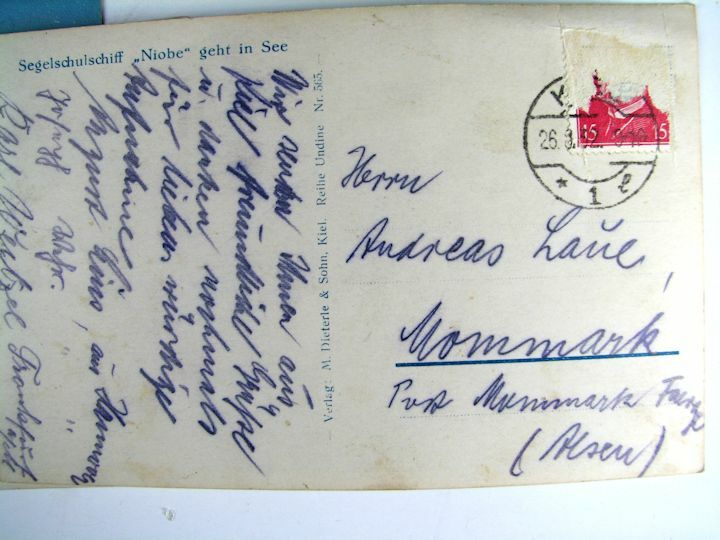 CENSOR STAMPED POSTCARD FROM GERMANY: Dated 1918 postmark. 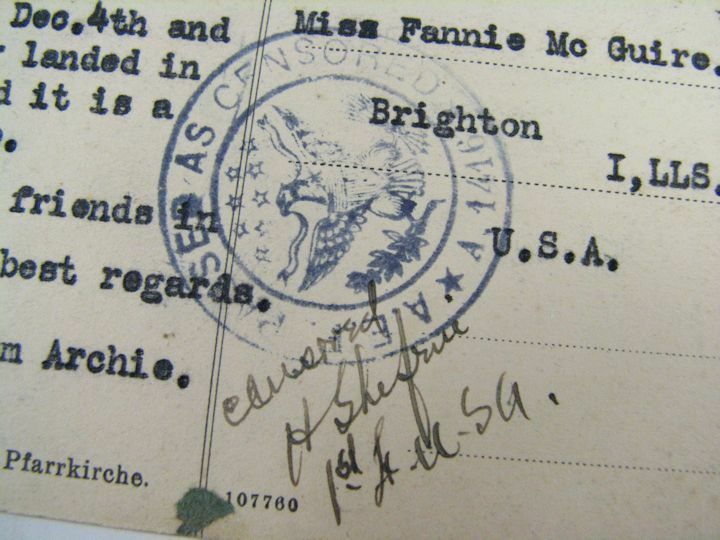 It has a CENSOR STAMP of American Expeditionary Forces. 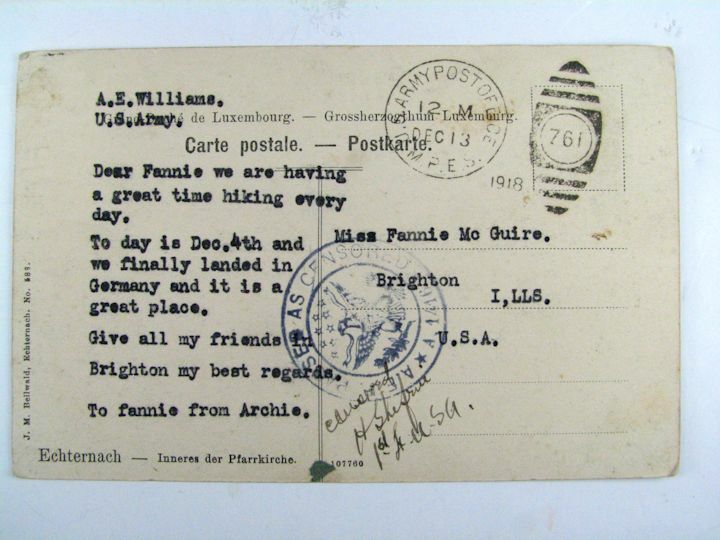 Doughboy Williams had a sense of sarcastic humor: "We are having a great time hiking every day" and "we finally landed in Germany and it is a great place". 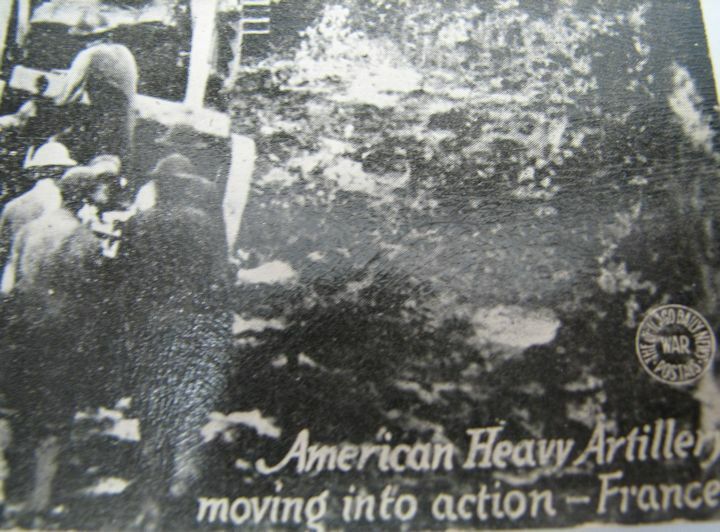 Hard to find WWI A.E.F. 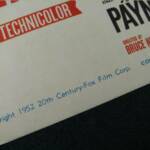 Censor Stamped material. 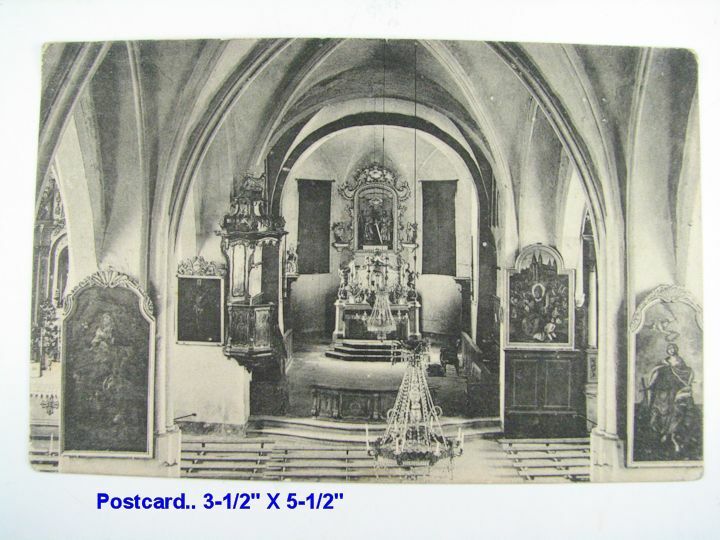 Image is of what looks like a Church or Cathedral. 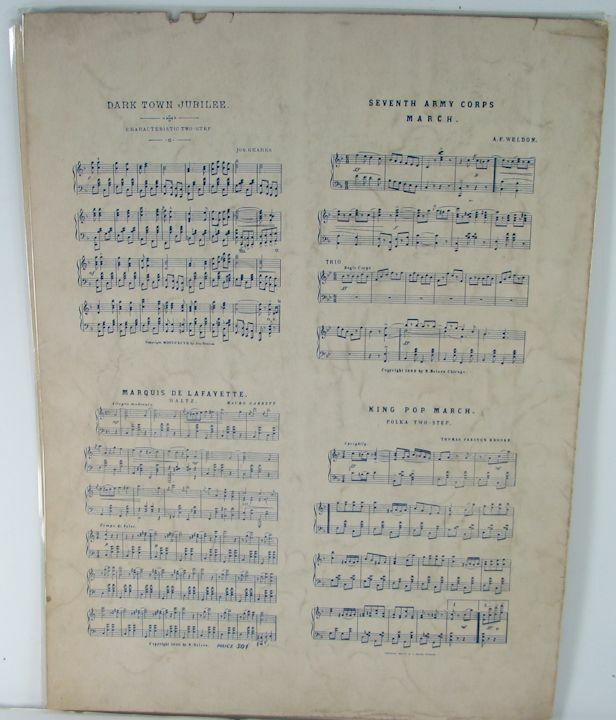 ANTIQUE, 1906 SHEET MUSIC: Laminated in plastic. 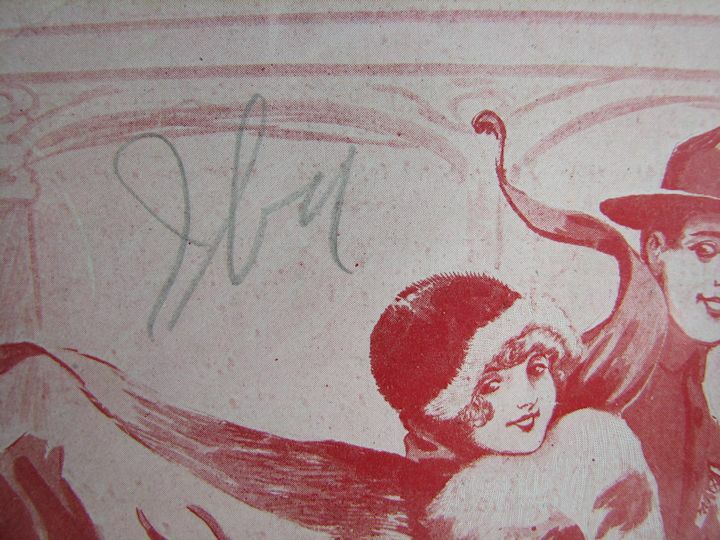 Copyright of 1906. 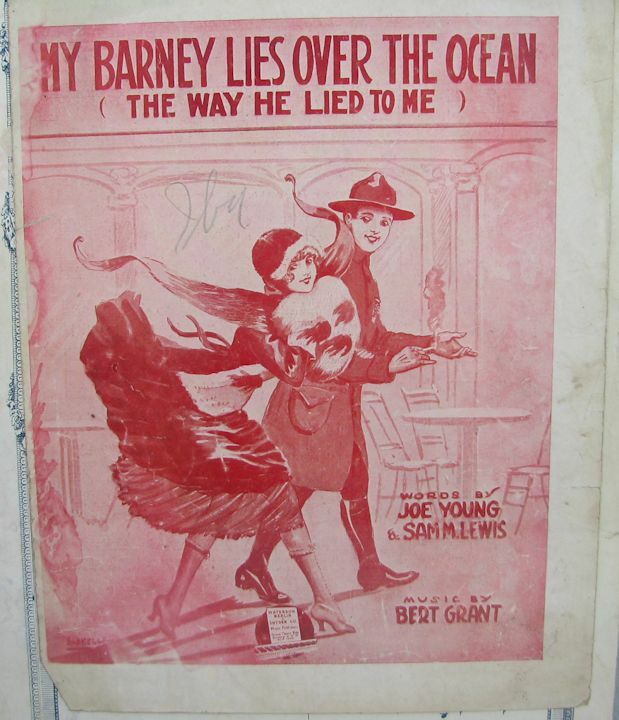 Size is about 13-1/2" X 10-1/2"
ANTIQUE, 1908 SHEET MUSIC: Laminated in plastic. 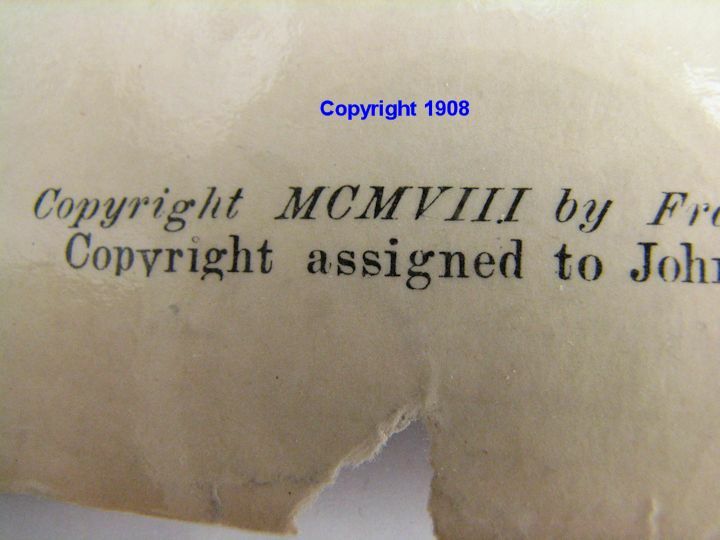 Copyright 1908. Size is 10-1/2" X 13". 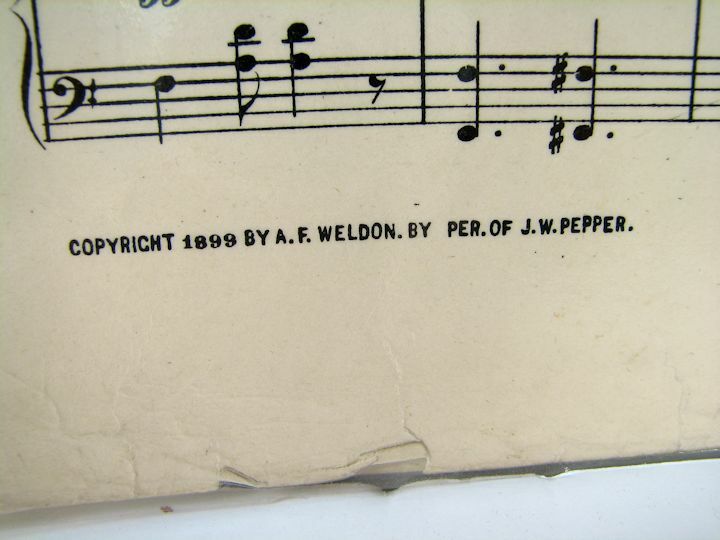 ANTIQUE, 1883 SHEET MUSIC: Copyright 1883. Very old and worn. Would look great framed and under glass. Size is 10-3/4" X 14". U.S. TARGETS: 10 targets that I believe were for military training. 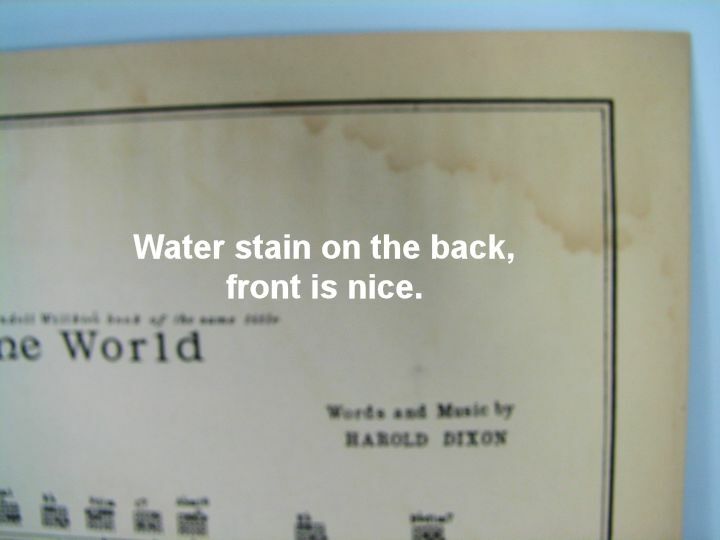 Some water stains along the right edge. 8-1/2" X 12". 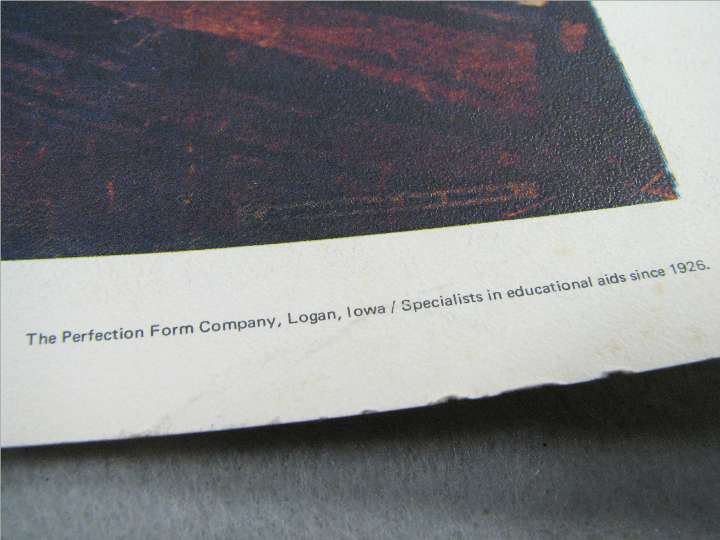 STATIONERY WITH HUMOROUS LETTERHEAD: Single sheet of stationery. 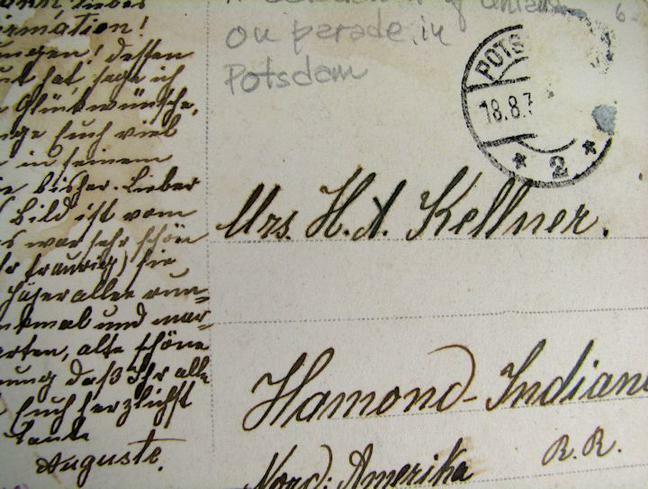 Hand written in the field is "Foreign Stamps". 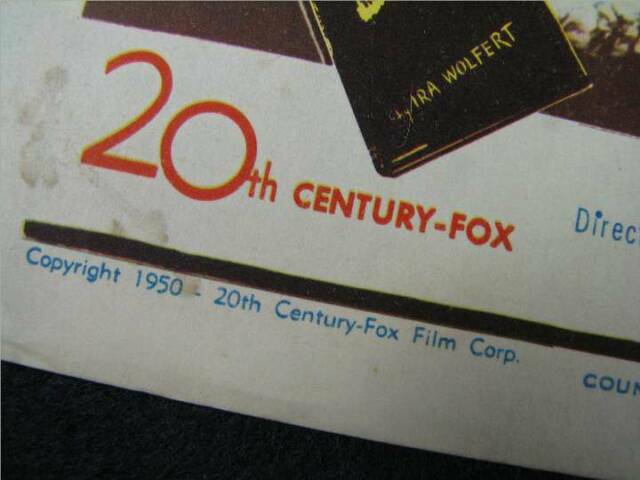 The letterhead on this stationery reads: "Hotel Fox Hole, Somewhere in Germany. Owner and Manager Lt. Bob Beckwith. Air-Conditioned Bed Room and Latrine. 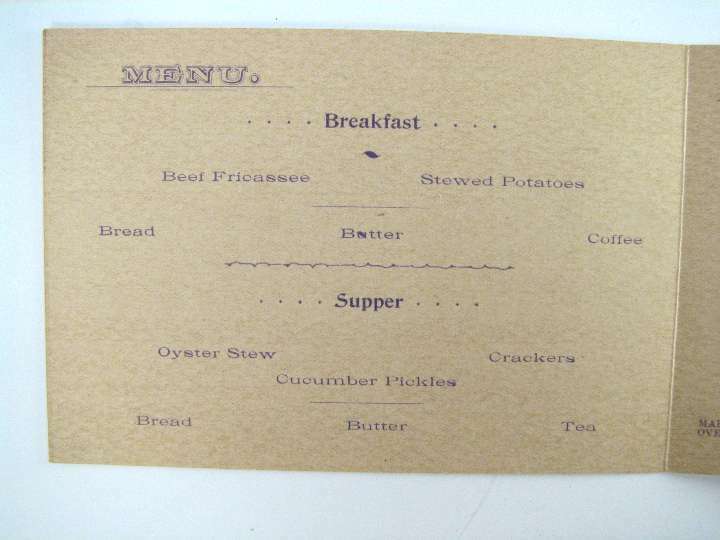 Finest Box Lunches (K Ration). Fresh Water Daily (For standing only). The Finest Mud in the Country for Beds and Long Walks. Bring your Gun, good Hunting. Ladies Welcome". 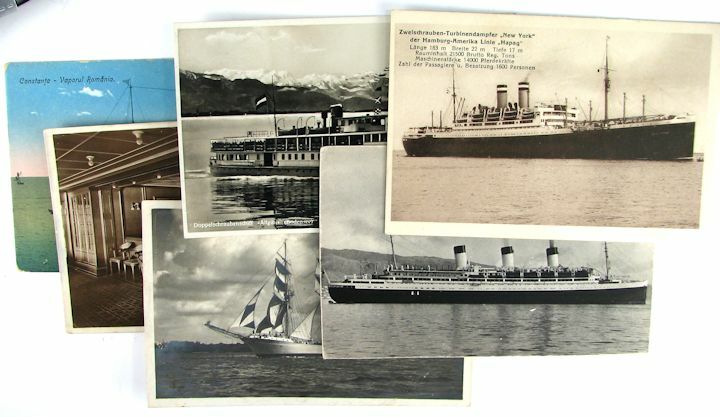 SIX WWI ERA POSTCARDS OF SHIPS, GERMAN? 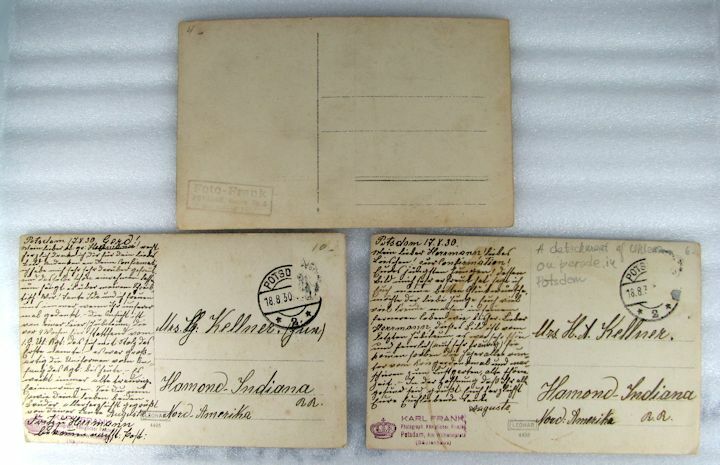 I can't read the writing on the backs or decipher the dates. But the ships look old enough to be around the WW1 time period. Bargain priced. All for one money. 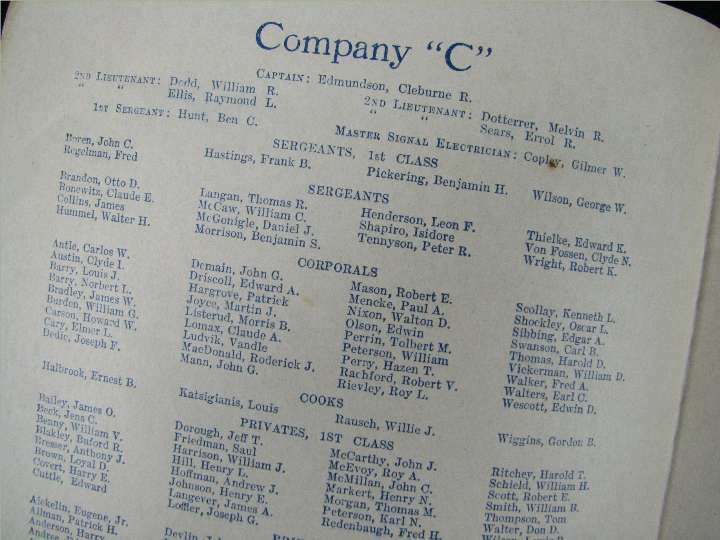 Homework of a student from WW2 Bombardier Training School. 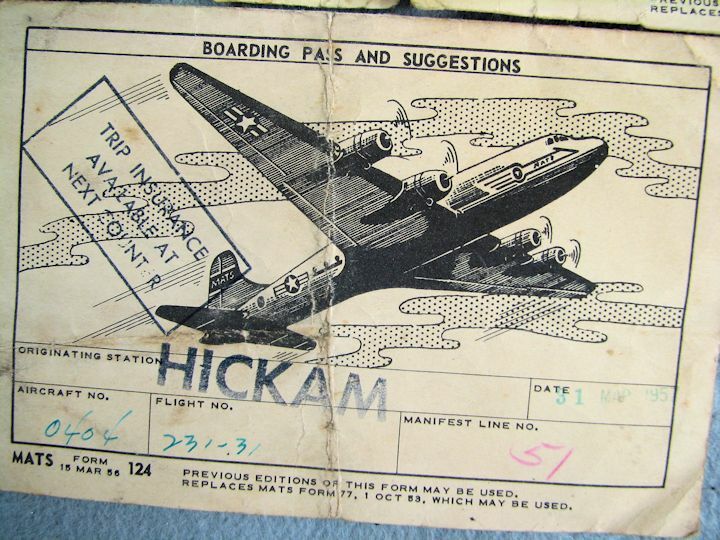 Lots of technical information with some drawings etc. Please see the photos for a good example of what is in this group of papers. 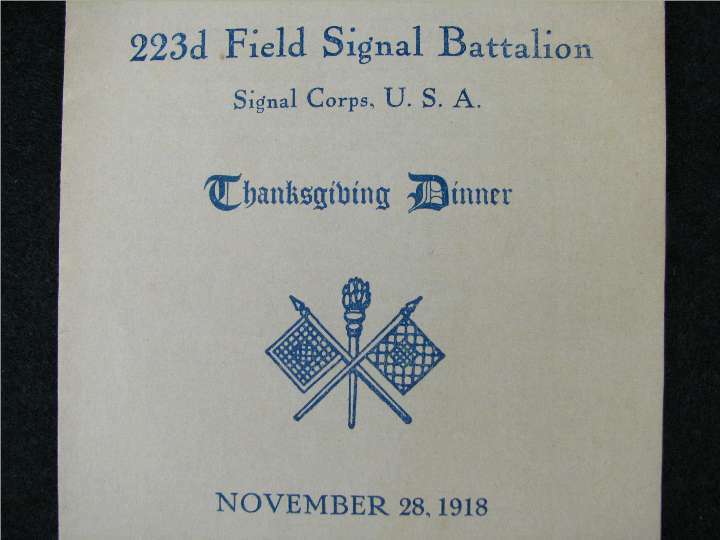 WW1 RELATED POSTCARD: 3.5" X 5.5" in size. Full of wrinkles and folds and some soiling front and back. Still a neat old Postcard. 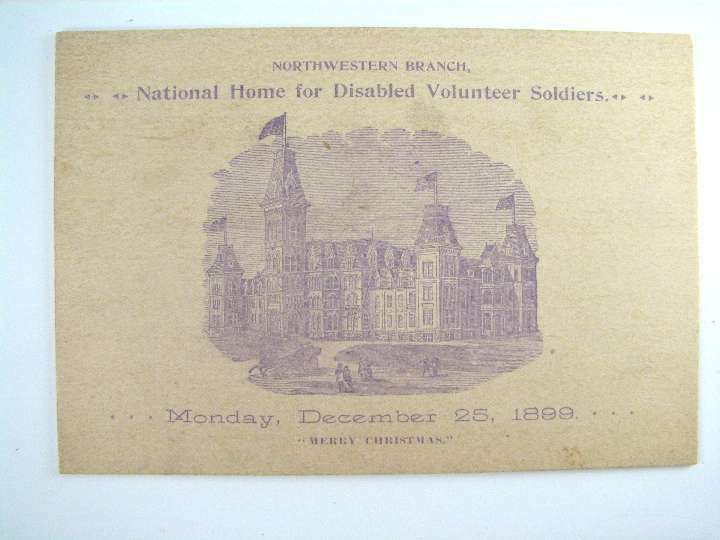 The date on the front of the truck is 1923 and the text on the back of the card appears to be an item sold whose proceeds were for the WW1 Disabled Veterans. Take a look at all the hardware mounted on the side of this vehicle!. These two Real Picture Postcards are of WW1 battle scenes. The top card has on it in white letters (hard to read) "ST. MIHIEL AFTER THE FINISH". 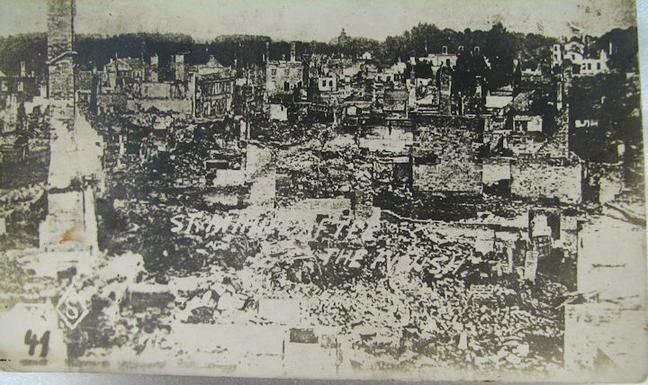 It is the destruction of a City. 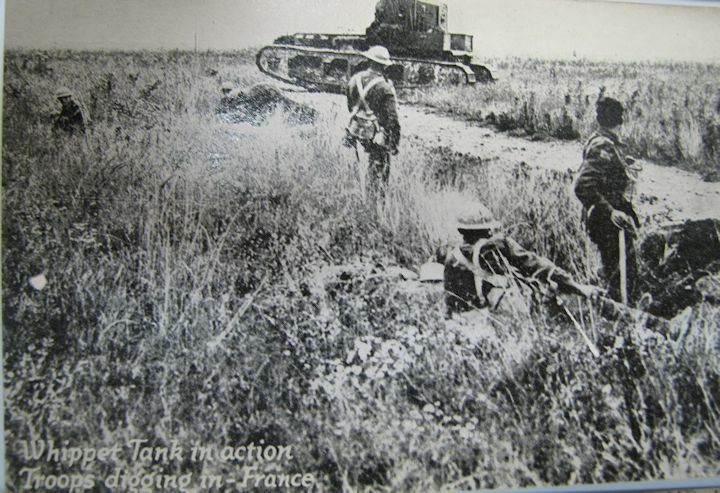 The bottom card looks like "No Man's Land" with smoke coming out of a trench. 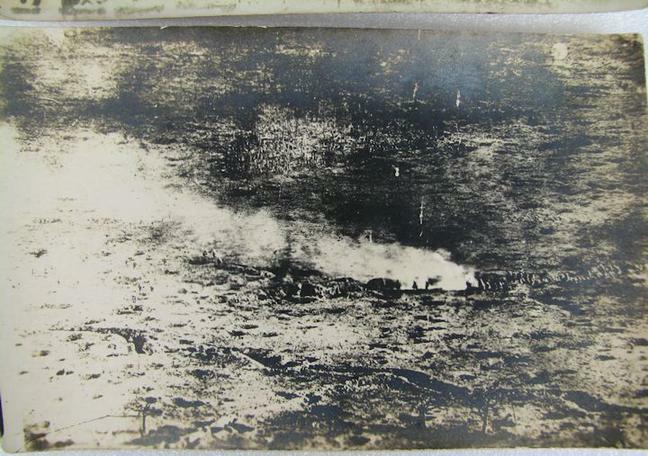 It looks like soldiers in the center right of the photo, right of the smoke. 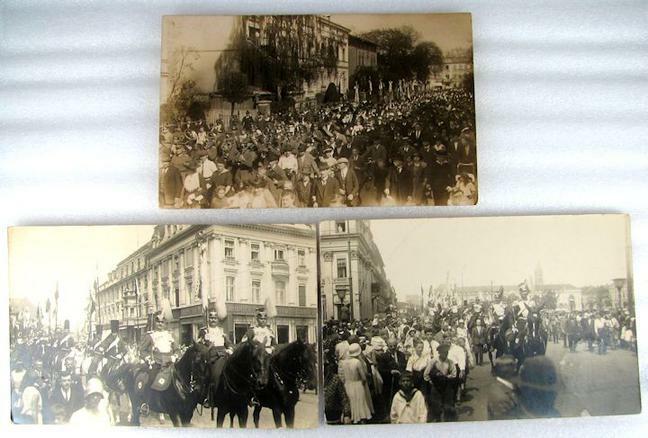 Neat historic photo cards. Condition is old with lots of handling through the years. No folds or creases. 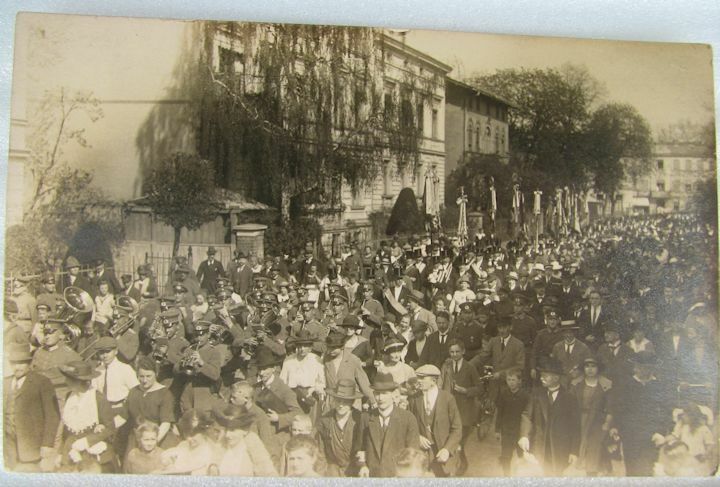 IMPERIAL GERMAN SOLDIERS ON PARADE, POTSDAM 1930: These three Real Photo Postcards look to have a postmark of 1930 and mailed from Potsdam. On one is written "A detachment of ? 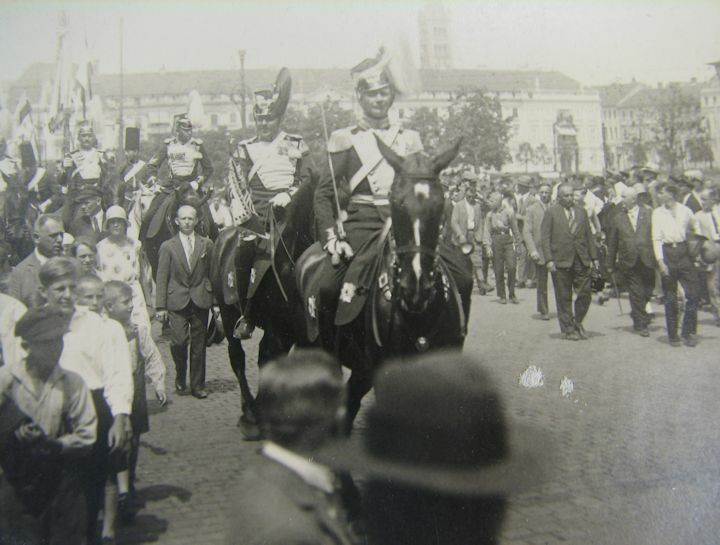 on parade in Potsdam". 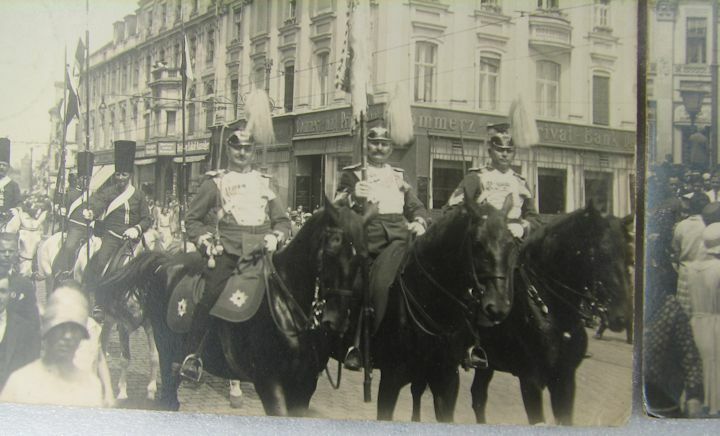 One shows good view of uniforms and horse tack. 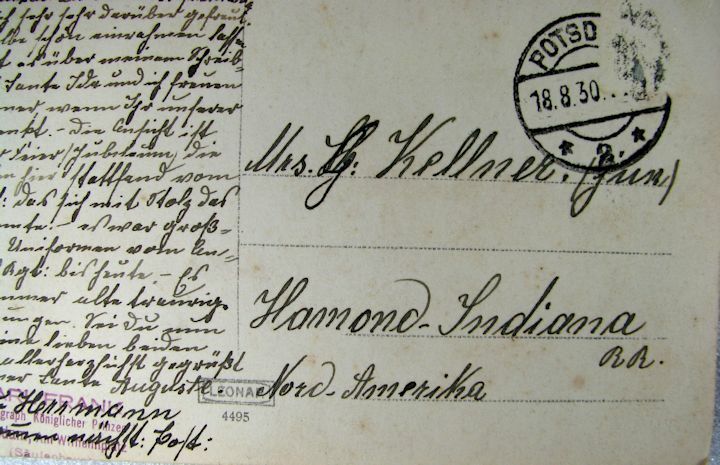 Two have been postally used and written in German. Neat cards. 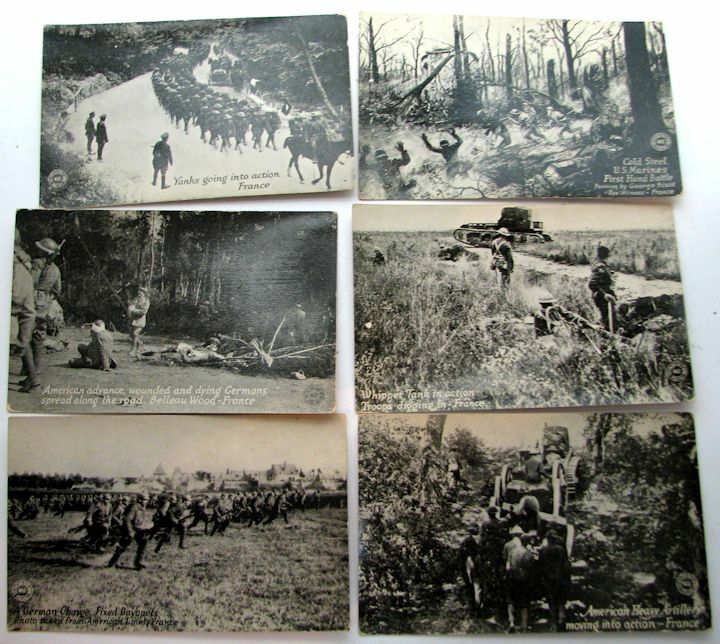 WW1, REAL PHOTO POSTCARDS: Six Real Photo Postcards of action, Doughboys and German, France. 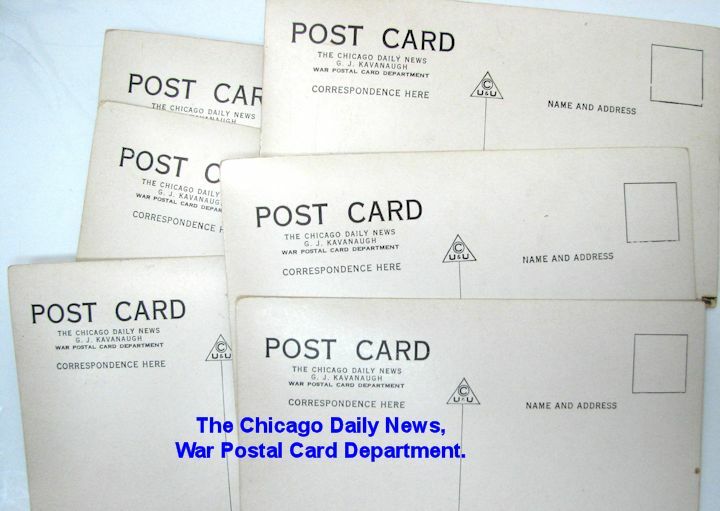 Published by the War Postal Card Department of the Chicago Daily News. G.J. Kavanaugh (google him). Have been handled a lot through the years and some minor corner wear but no creases, folds or wrinkles. (These normally sell for $10 each online). 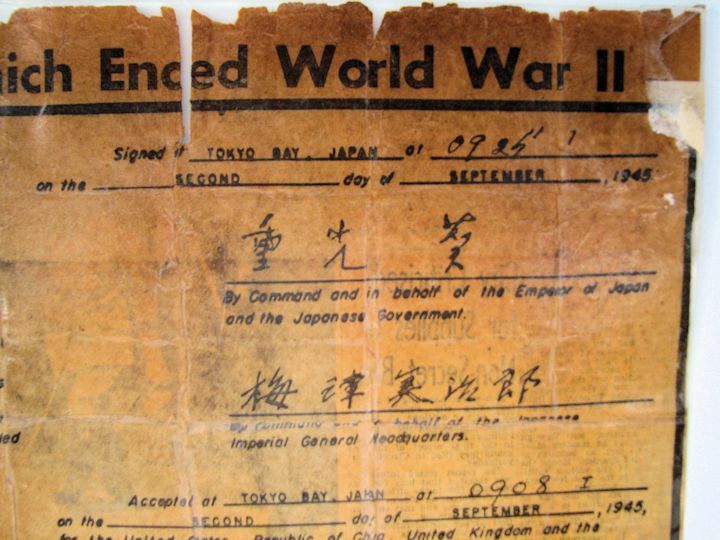 WW2 JAPAN SURRENDER DOCUMENT, U.S.S. 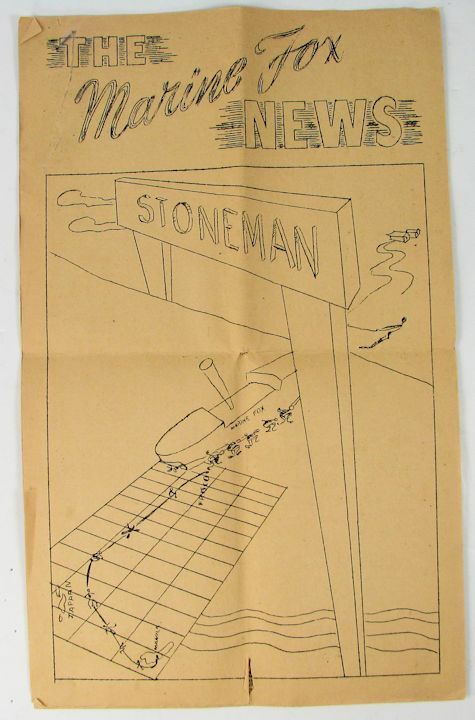 MISSOURI: This was originally printed Sept. 8, 1945 by the St. Louis Globe-Democrat. 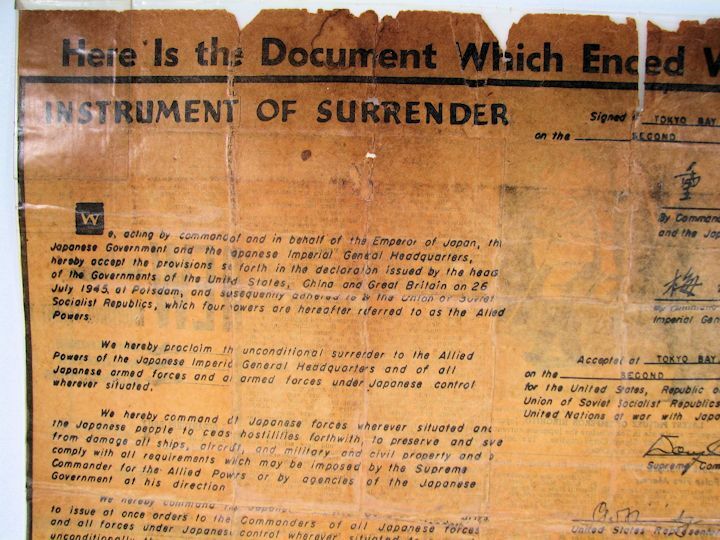 It is of the surrender document that was signed aboard the USS Missouri. 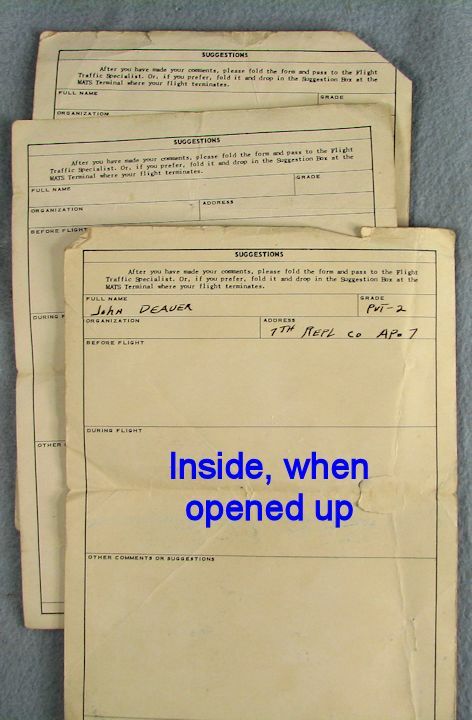 It was quite old when someone put a cloth backing on it and had it laminated. It is solid and ready to hang on your wall. It looks good and old. It is about 15" X 15". 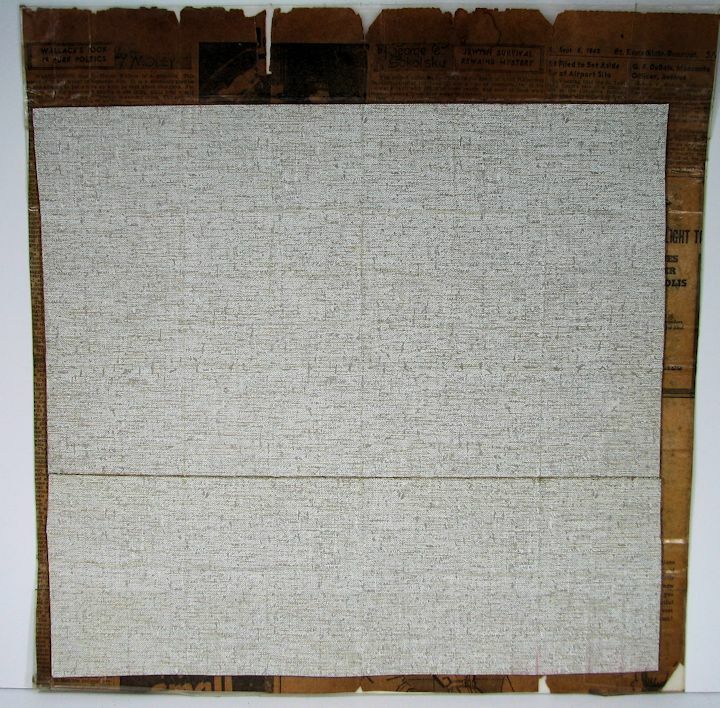 WW2 "WAR MAP" BY SKELLY OIL WITH CLIFTON UTLEY: 24" X 16" with maps on both sides. Fold lines with minor splitting at the folds. There is some soiling at the top by the word "WAR". 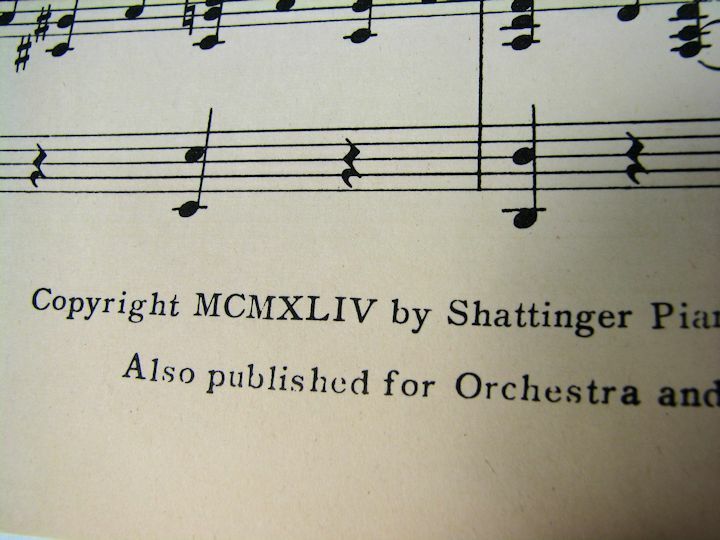 Copyright 1944. 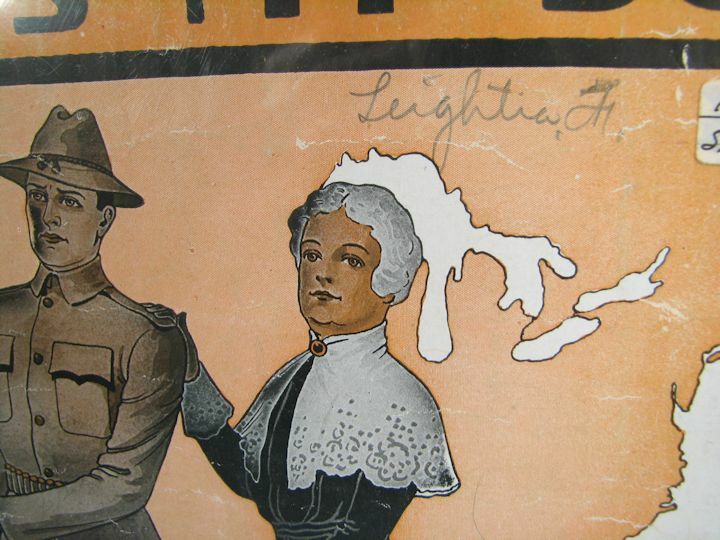 Nice artwork on these old sheet music papers. Would look good framed. 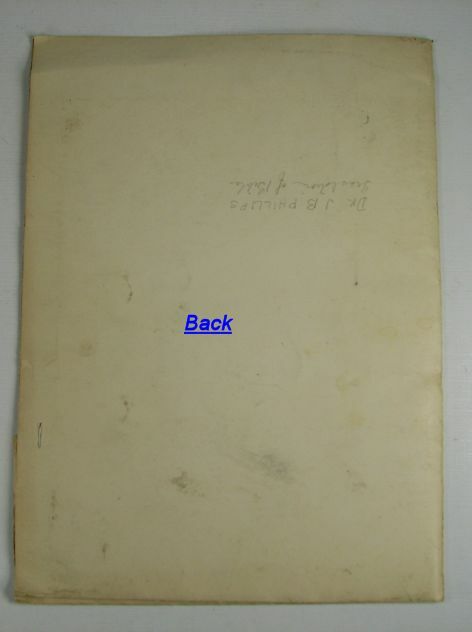 This one is near excellent on the front cover but does have a water stain on the back cover at the top right. "The people down in old Saint Louie, said Louie never would make good. You've got to 'Show me' in Miz-zou-rie, and Louie showed them that he could". 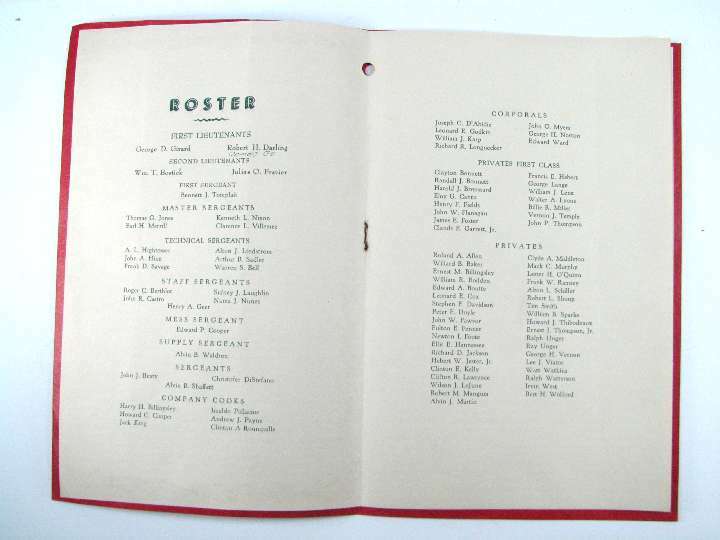 S.S. MARINE FOX, JULY 15, 1946 ON-BOARD NEWSLETTER: Consists of 5 pages stapeled at the top left corner. 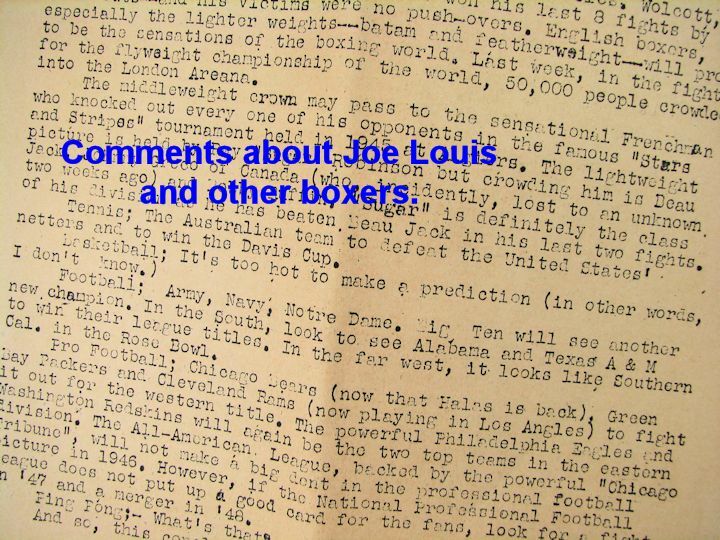 All the news of that period including Sports (Joe Louis, baseball and more), Atomic Power, Inflation, World News, facts about the U.S.A. etc. 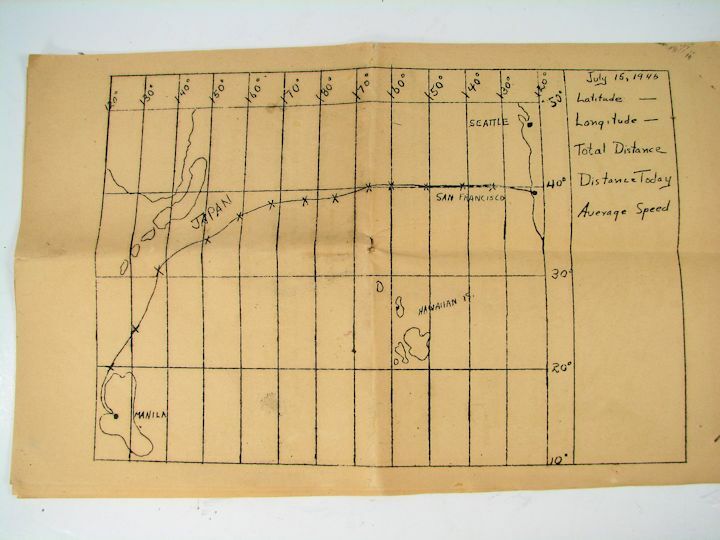 and on the back is a chart of their voyage from Manila, PI to San Francisco. Interesting reading. It has been folded and has some tears. 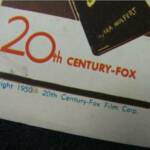 I have not researched the S.S. Marine Fox. I will mail it folded up in a medium size envelope for $1.00 postage. 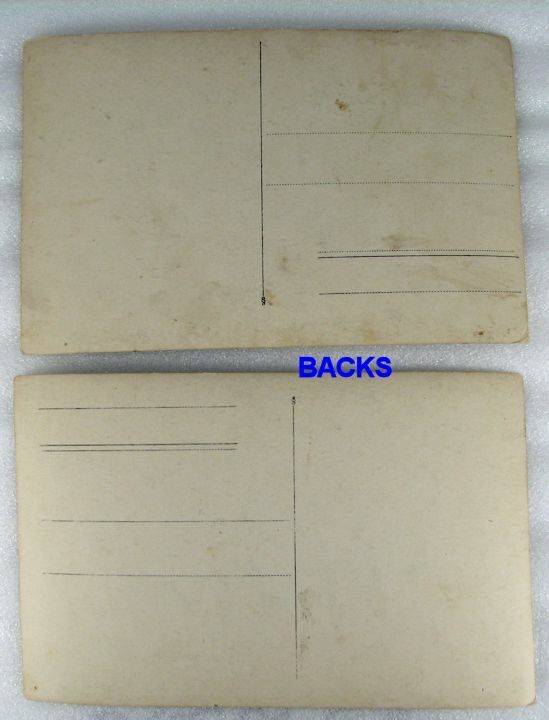 WW2 TOBACCO RATION CARD and TWO US NAVY MESS HALL PASSES: The two Navy Mess Hall cards look the same but are different and they are both issued to a Lt. (jg) C.H. McCullough. The tobacco card is for the period May-October 1945 and was issued to an enlisted sailor by the name of R.B. Johnson. I was unaware of a tobacco ration period. 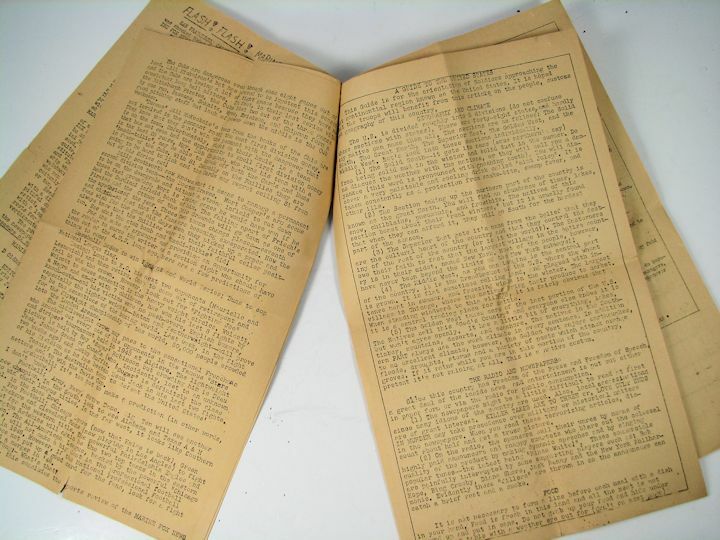 SHIPBOARD NEWSLETTERS, S.S. GEORGE N. DERN, "DERN GOOD NEWS": Four multipage printings of 11th, 13th, 15th and 17th of October, 1945. The one on the 17th looks to be the last one printed. 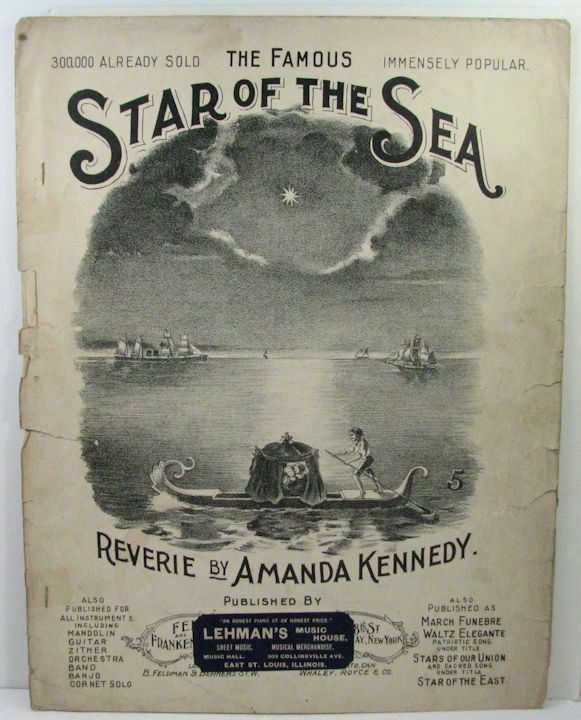 Printed during their return voyage to the States. 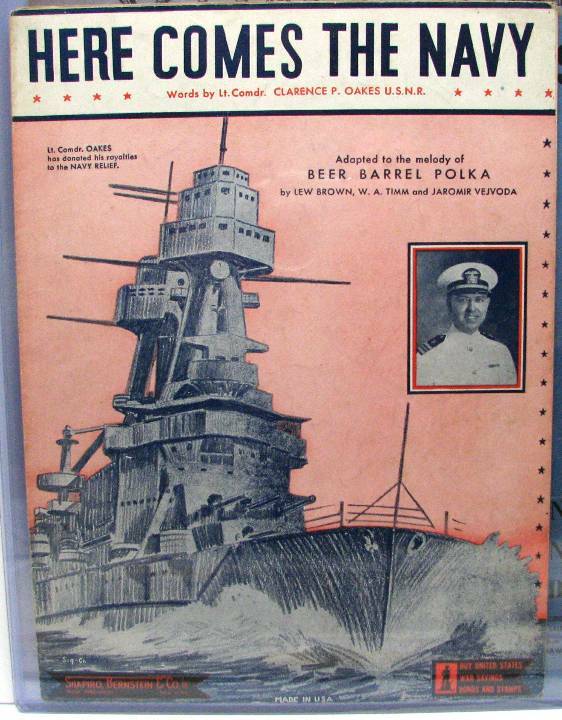 The S.S. George H. Dern was named for George H. Dern, Secretary of War 1933-1936. Launched 19 December 1942. Sold private 1947, scrapped 1969. 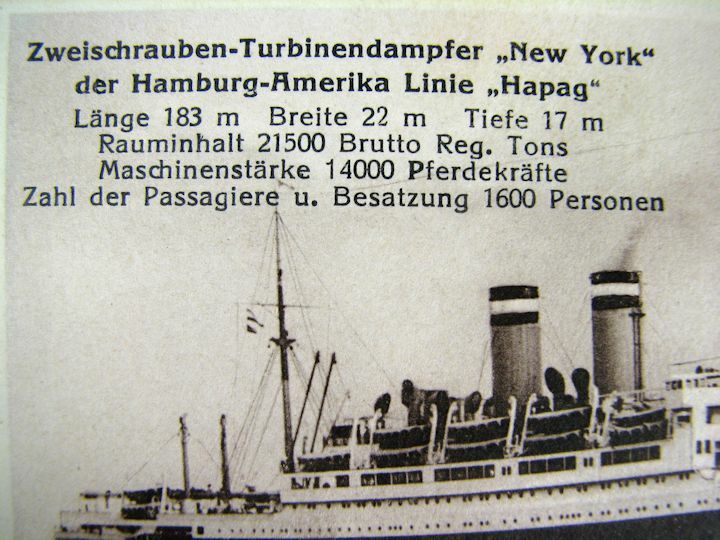 It was one of the Troop Carrying "Liberty Ships" of WW2. 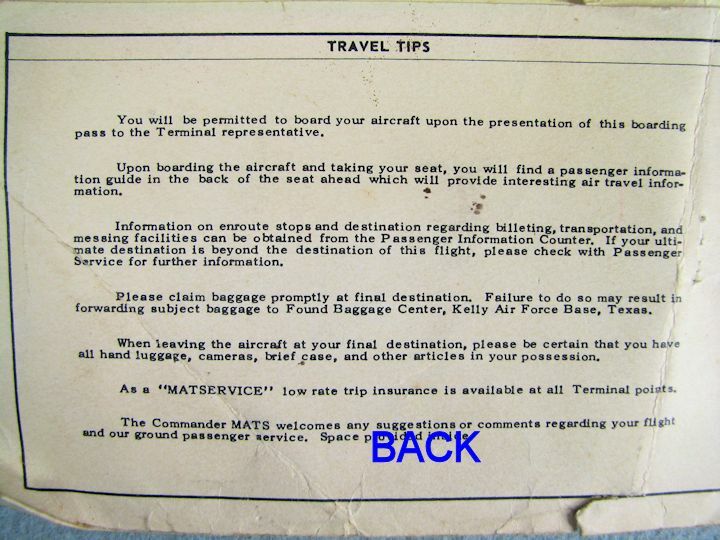 FIRST FLIGHT COVER AND LETTER. 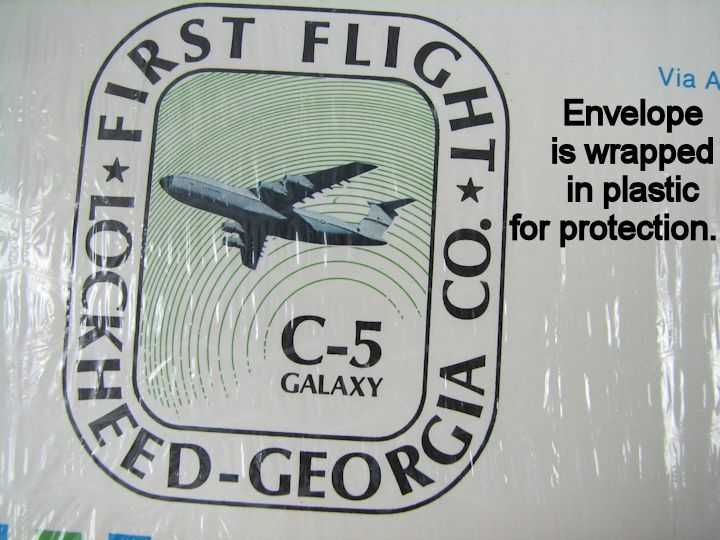 C-5 GALAXY, 1968: This envelope is wrapped in plastic and taped. There appears to be a letter inside but I did not unwrap it to see what the letter says. 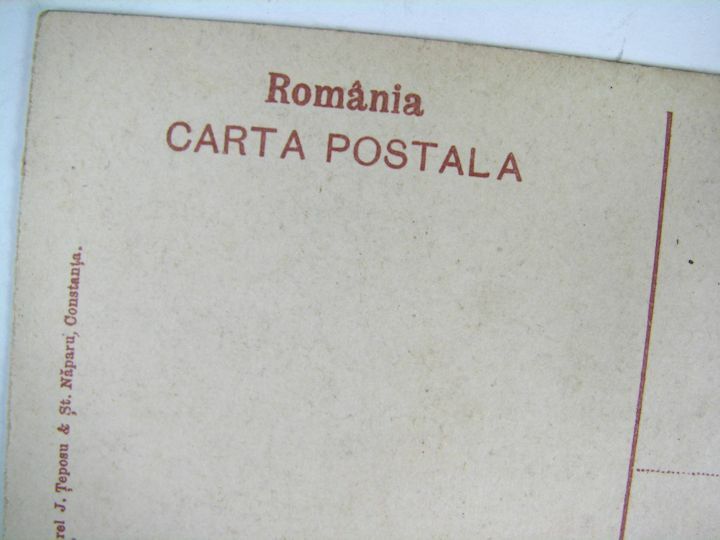 Postmarked 1968. 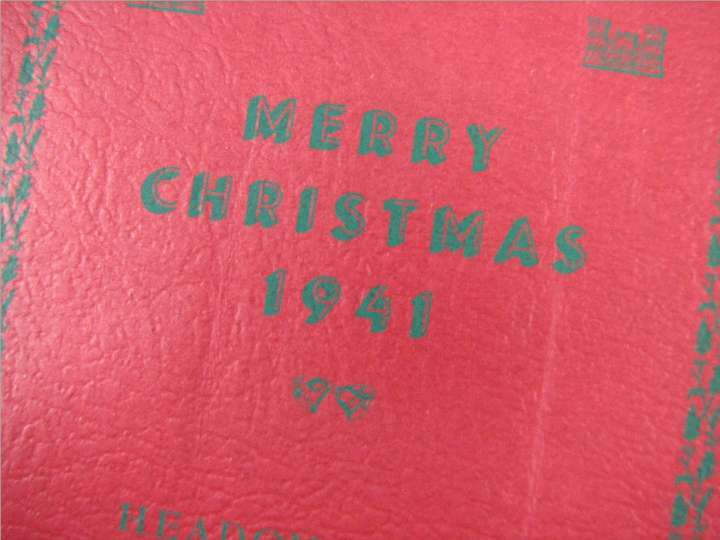 FIRST FLIGHT COVER, 1941. 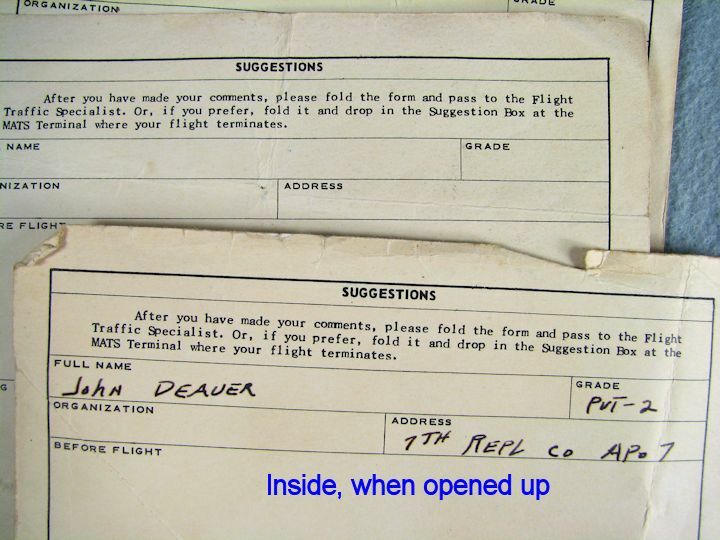 B-19 BOMBER: This is just the neat envelope, no letter inside. Nice graphics on the front. 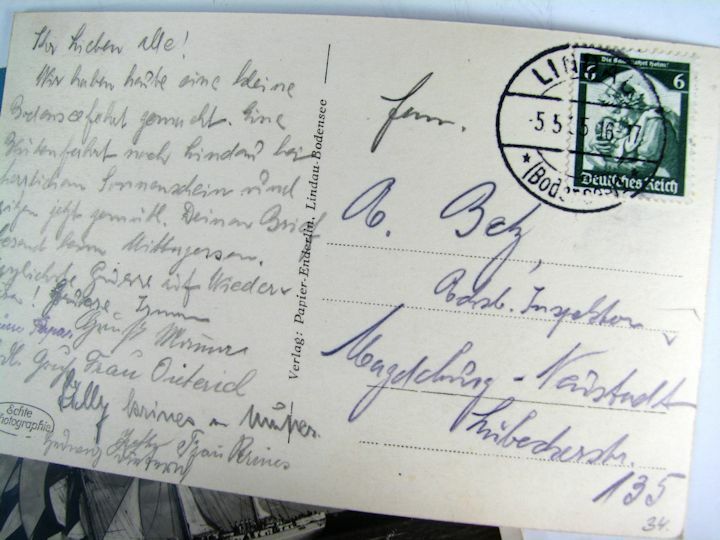 Postmarked 1941. 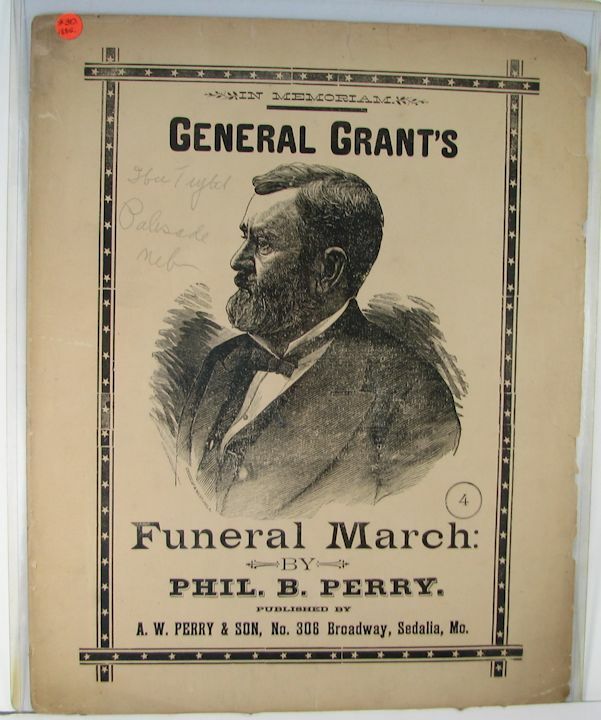 1885 PUBLISHED SHEET MUSIC, "GENERAL GRANT'S FUNERAL MARCH": Not laminated and in a rigid plastic sleeve. Condition is fair showing 130 years of wear and age. 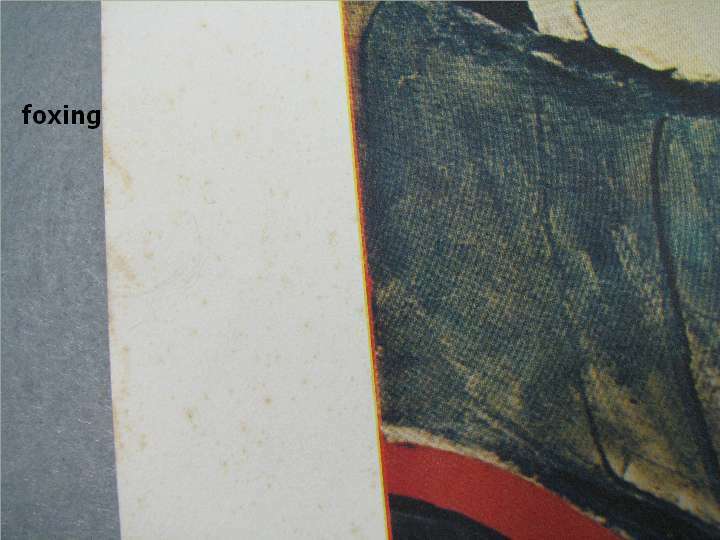 Edges are tattered and pages have browned. 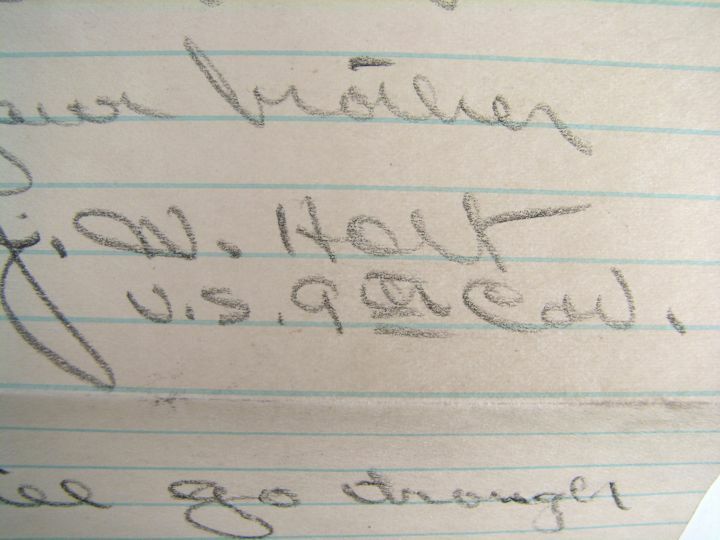 Hand writing from Nebraska in front of Grant's face. 13-1/2" X 10-3/4" in size. 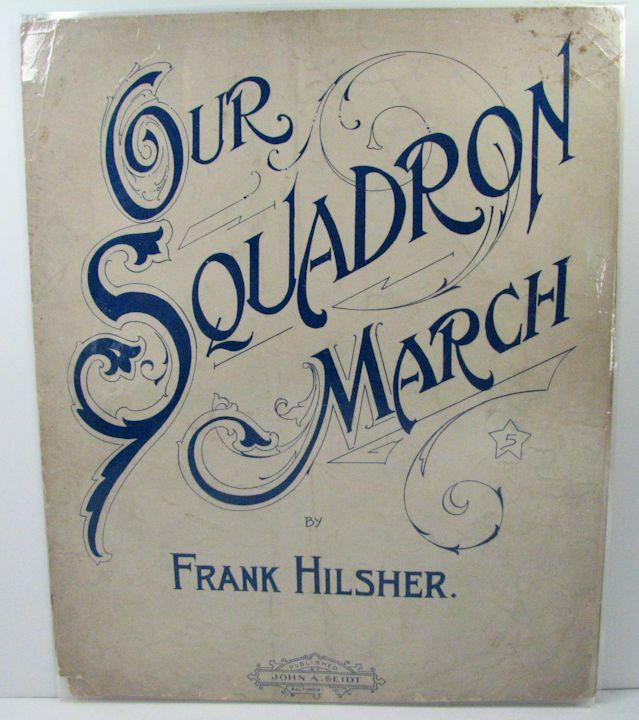 WW1, 1918 PUBLISHED SHEET MUSIC, "OUR NAVY FOREVER": Patriotic Naval March. 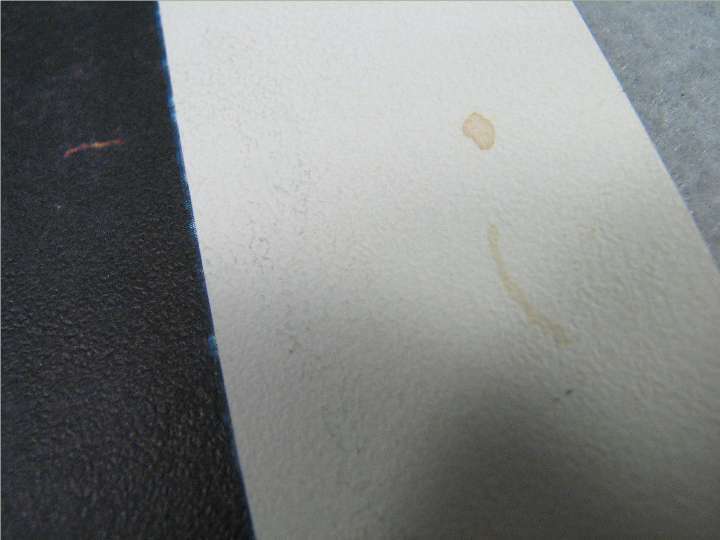 Was in poor condition with lots of edge wear and tears but has been laminated to prevent further damage. Browned from age. 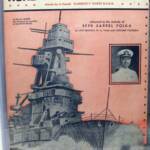 Nice Battleship art work for framing. 13-1/2" X 10-3/4". 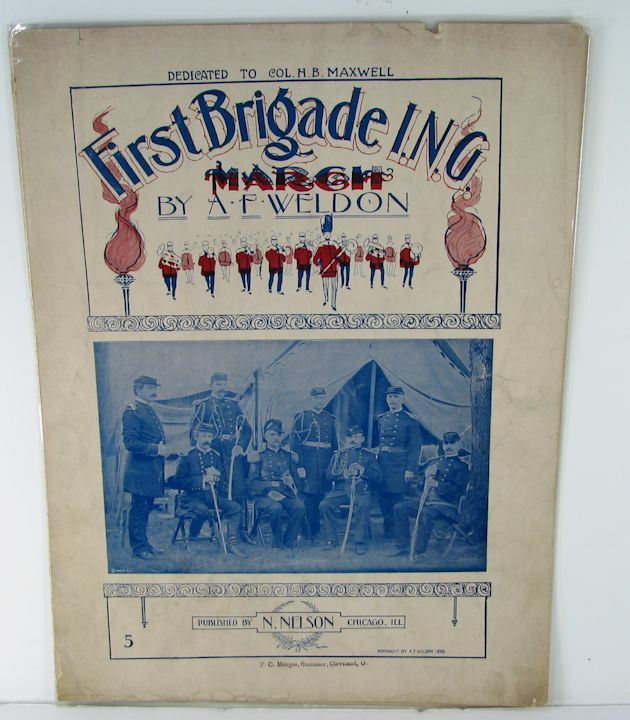 1899 PATRIOTIC SHEET MUSIC, "FIRST BRIGADE I.N.G. ": Dedicated to H.B. 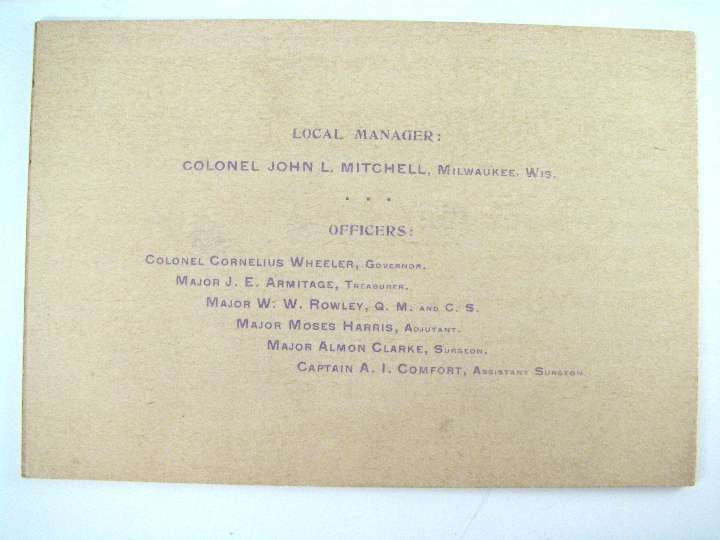 Maxwell, Illinois National Guard. 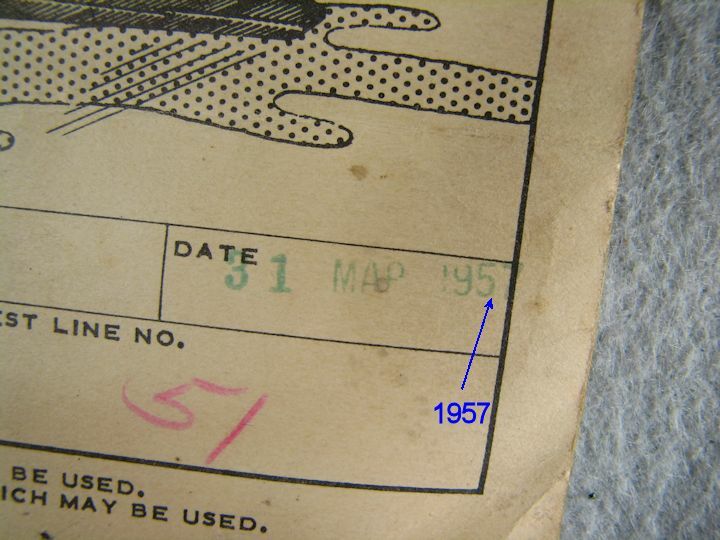 Fair condition and it has been laminated to prevent further deterioration. Size is 14" X 10-3/4". 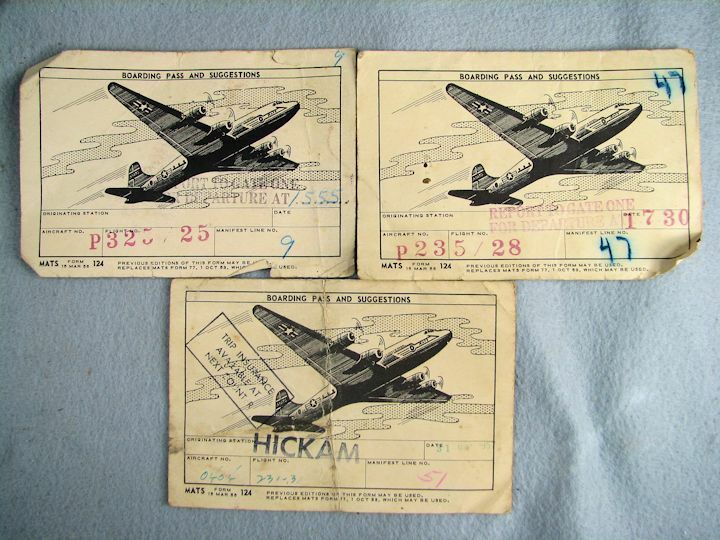 USAF; THREE "MATS" BOARDING PASSES AND SUGGESTIONS: All three are MATS form 124 dated 15 MAR 56. 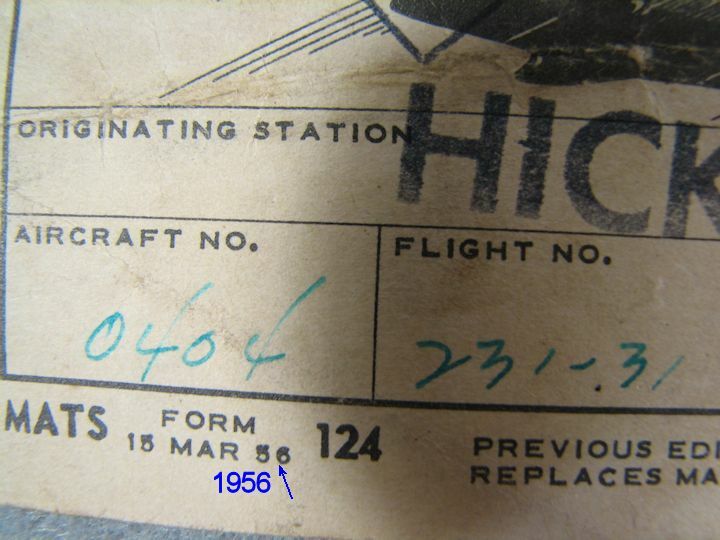 One is used dated 31 MAR 1957; one is ID'd with the Airman's name; one is stamped "HICKAM". All three are well used and show it. Probably by the same Airman traveling to new Duty Station. 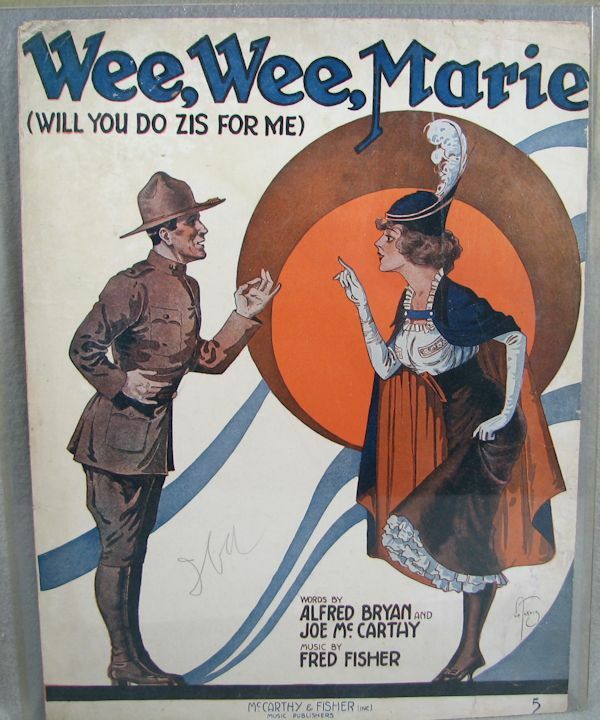 WW1 PATRIOTIC SHEET MUSIC: Two songs with this. Edge wear and some tears. 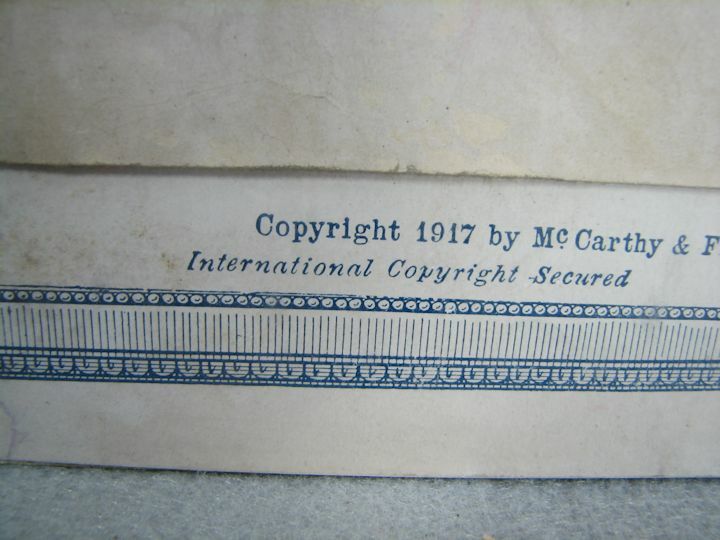 1917 Copyright. These look good framed like a photo. 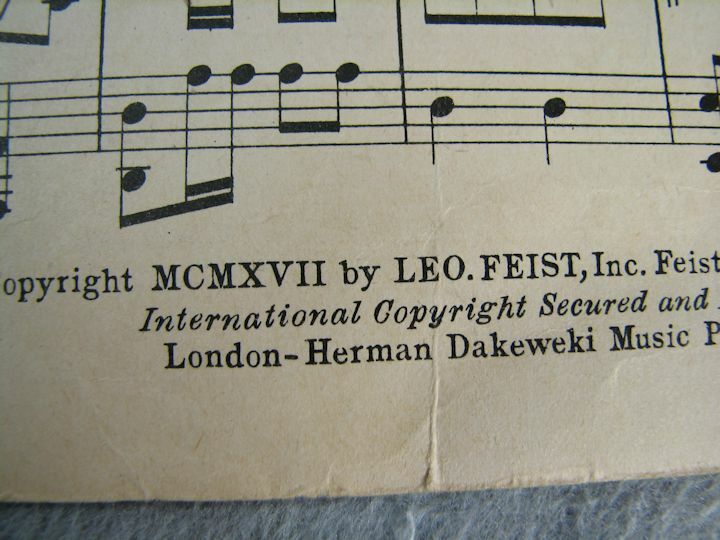 WW1 PATRIOTIC SHEET MUSIC: Copyright 1917. Lots of edge wear and tears. These look good framed like a photo. 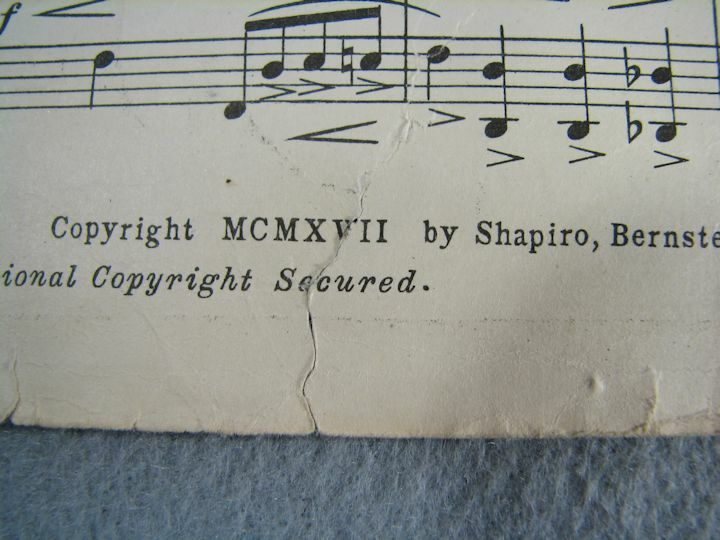 WW1 PATRIOIIC SHEET MUSIC: Copyright 1917. Lots of edge wear and tears. Has been folded and creased. These look good framed like a photo. 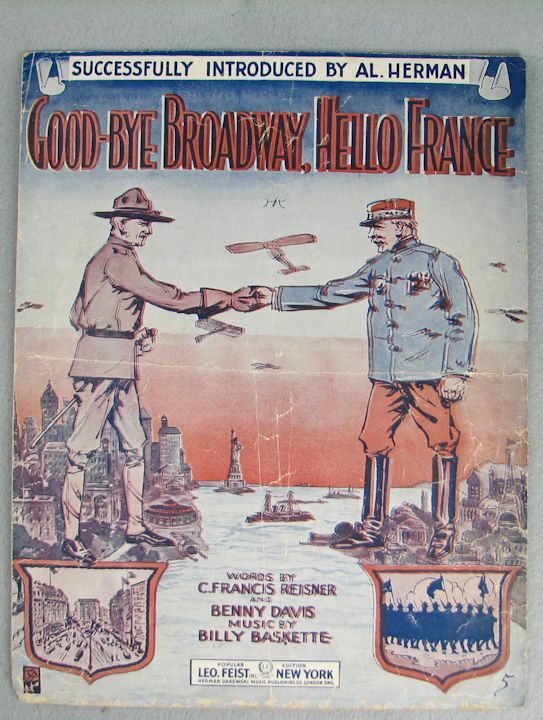 IRVING BERLIN, WW1 PATRIOTIC SHEET MUSIC: Copyright 1917. Lots of edge wear and tears. These look good framed like a photo. 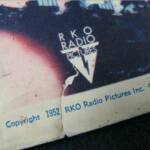 (A bonus song is on the back). 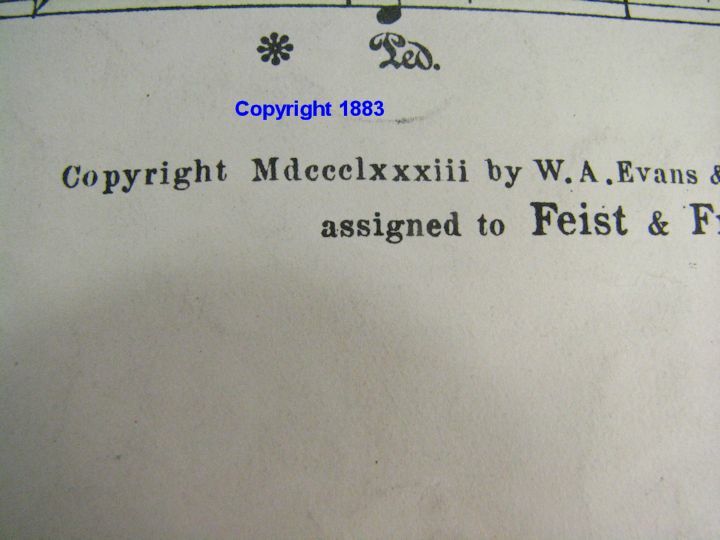 PERSHING, WW1 PATRIOTIC SHEET MUSIC: Copyright 1918. Image of Pershing. Lots of edge wear and tears. These look good framed llike a photo. 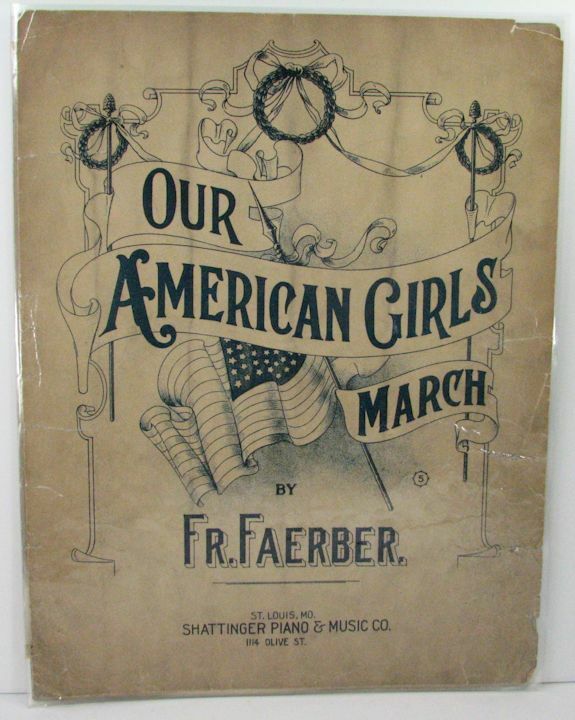 WW1 PATRIOTIC SHEET MUSIC, "The Sentiment of Every American Mother": Copyright 1917. Edge wear and tears. These look good framed like a photo. WW2 POW, BATTLE OF THE BULGE. COMIC POSTCARDS: There are 10 of them. 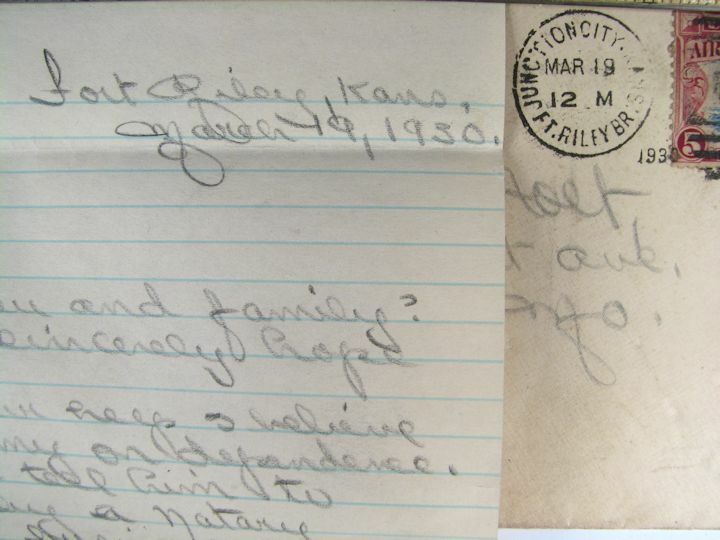 They were mailed in 1943 from Fort Jackson, SC to Kampsville, Illinois. Pvt. 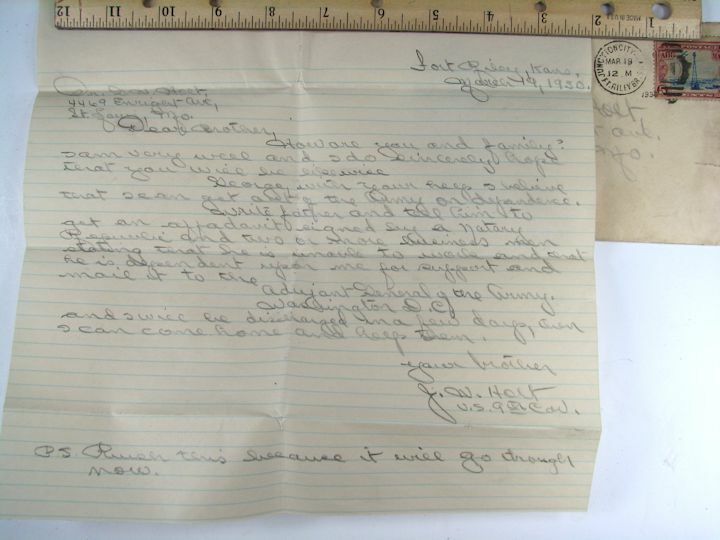 Russell Foiles (106 RCM Troop) to Mr. Eugene Foiles. 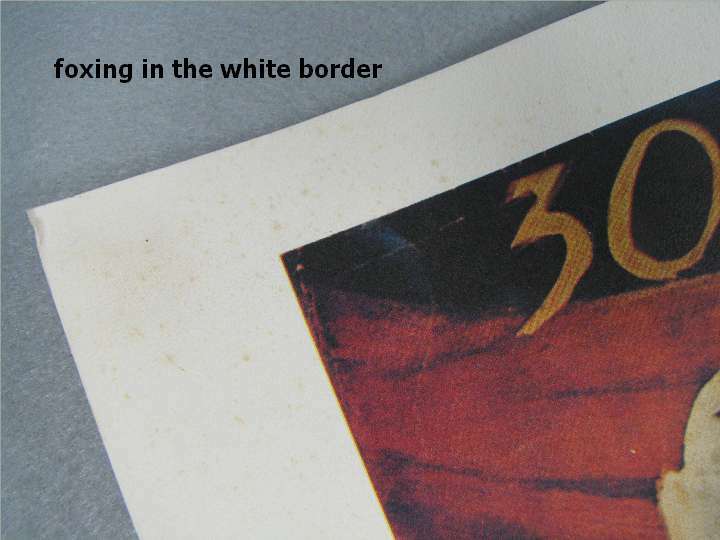 They were glued in a scrapbook and the pages remain stuck to the backs. 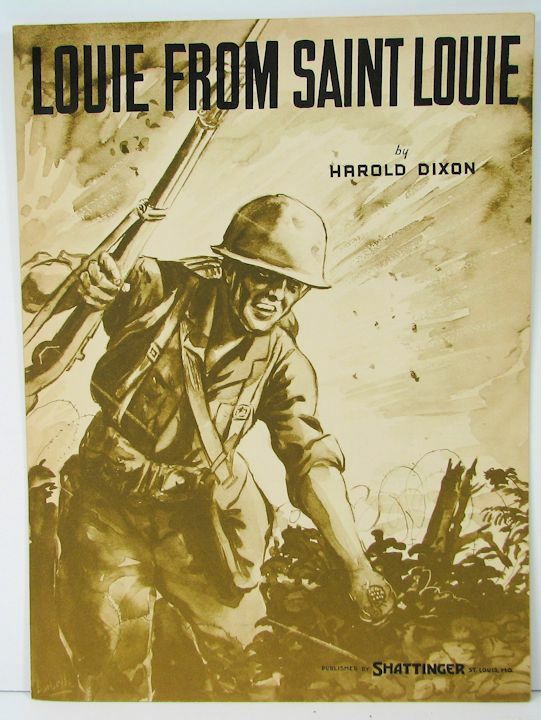 Foiles was with the 106th Inf. Div. 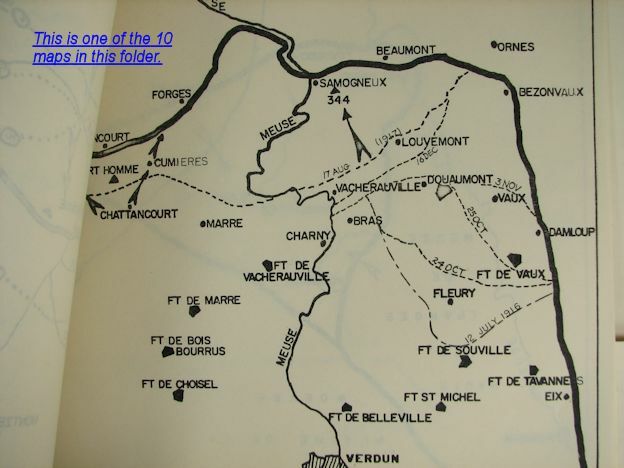 and was captured by the Germans December 1944 during the Battle of the Bulge. He served the rest of the War in Stalag 4B. He passed in 1976. Includes some research. 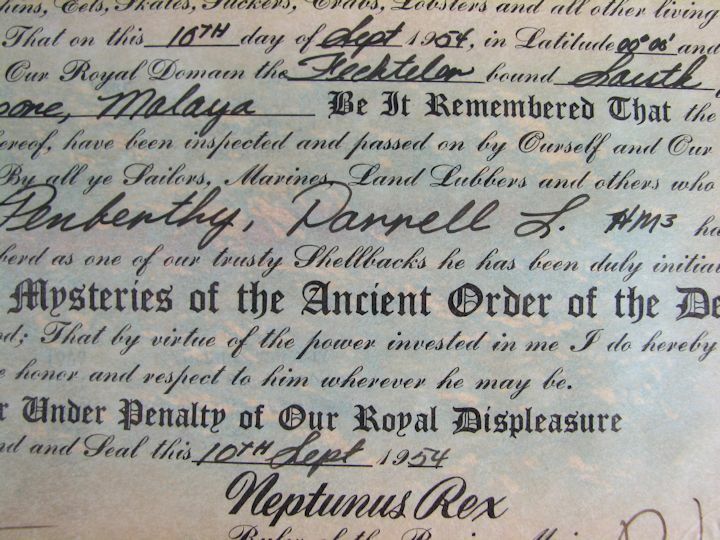 SHELLBACK INITIATION CERTIFICATE; 1954 ABOARD U.S.S. FECHTELER, DD-870: 11" X 14", full color. 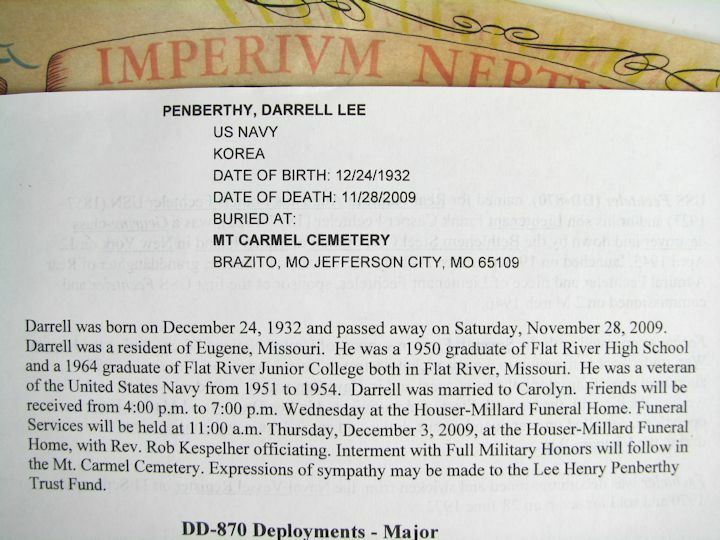 Burial information on recipient and on the Fechteler included. 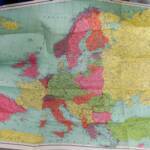 WW2 WAR MAP OF EUROPE WITH STATISTICS: A great Rand McNally War Map. 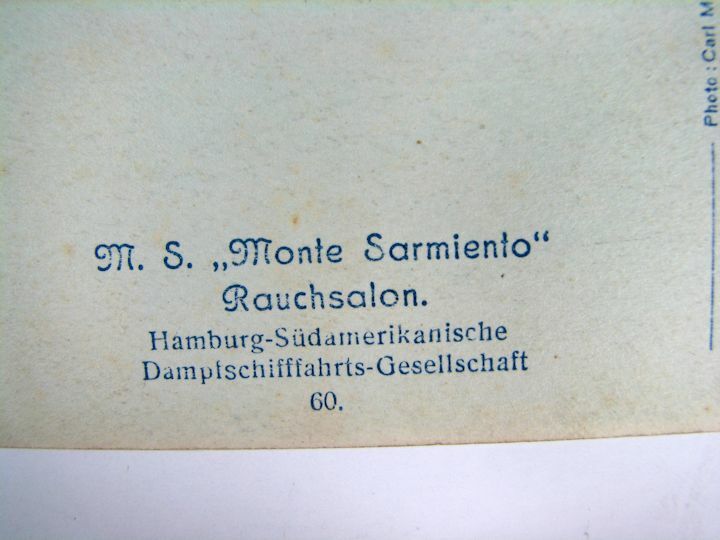 Front side shows European Countries with an overlay showing 1914 (Pre WW1) borders. 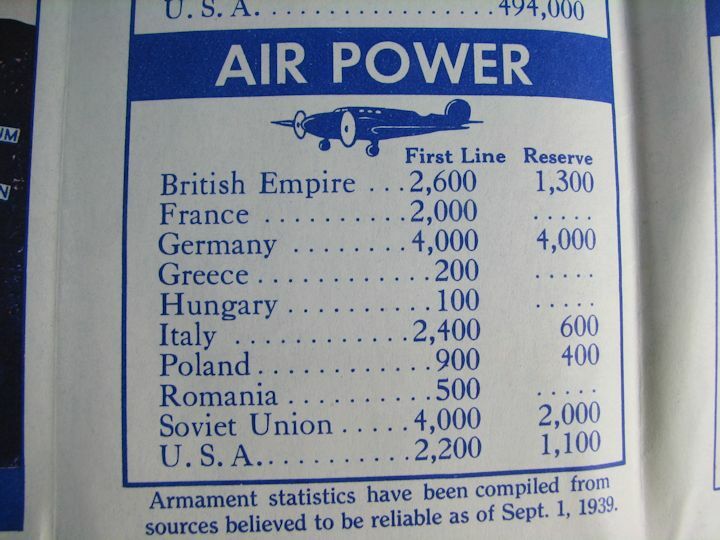 On the back side are stats showing strength of different Countries relating to troops and equipment. 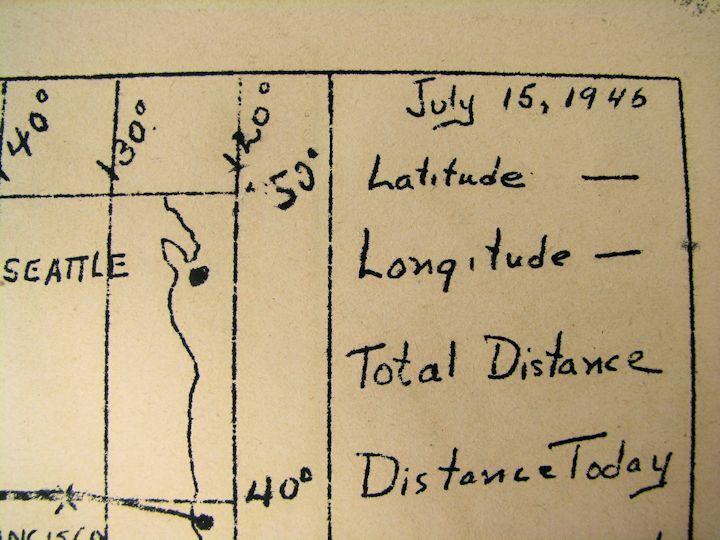 Good condition with just some minor splits at the bottom of the folded up map. 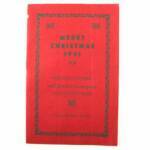 I could find no date for the map but the statistics have dates with the latest I saw being 1939. 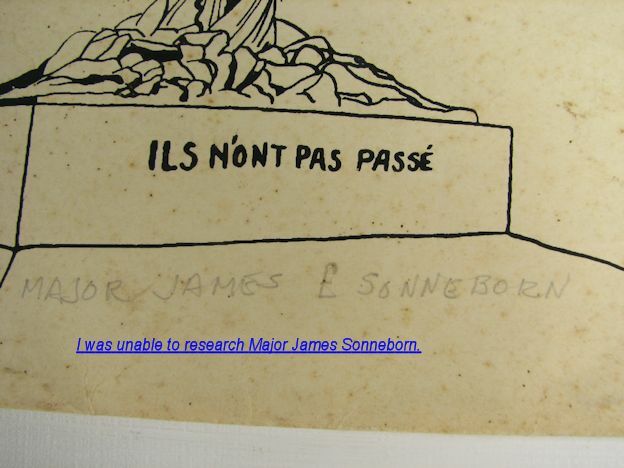 There is an interesting "Maginot Line" fortification drawing. 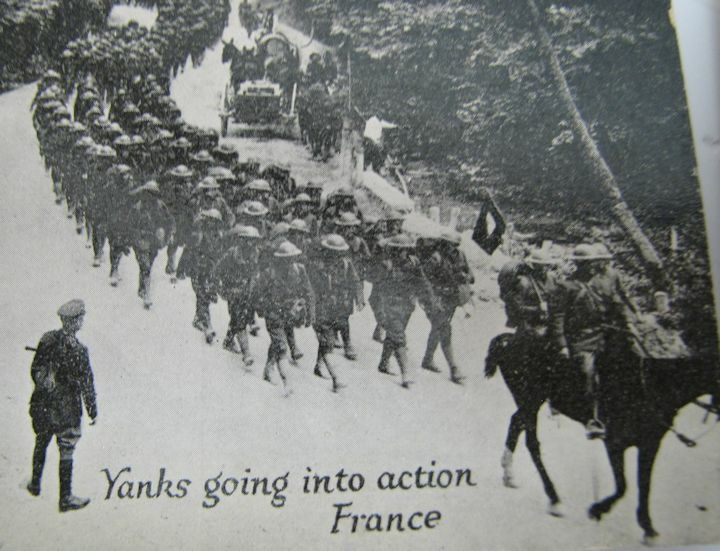 Lots of other interesting facts about the War. INVASION VICTORY MAP OF EUROPE: Very large, one sided map, (made to tack to the wall) measuring about 38" X 33". Has quite a bit of damage in the folds and edges and a few holes too. 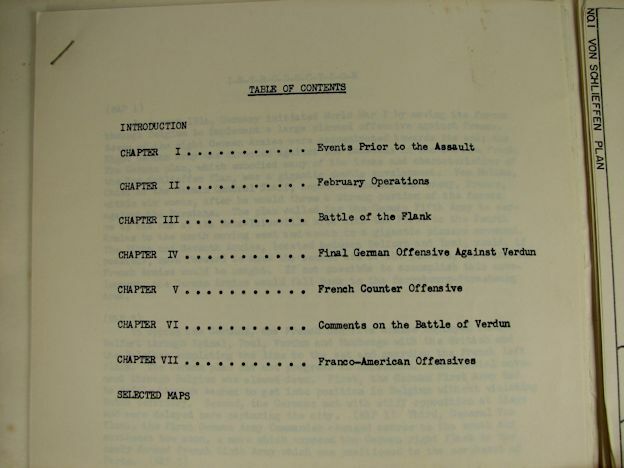 Actual title is: "The United Allied Nations Invasion Victory Map of Europe, Mediterranean, Near East and North Africa". 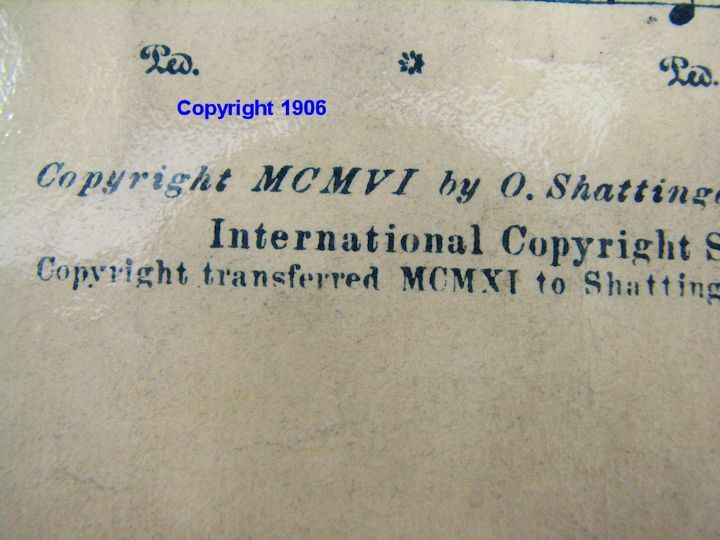 I see no publishing information on it nor a date. Note the heavy red line is the furthest advance into Russia by Germany. 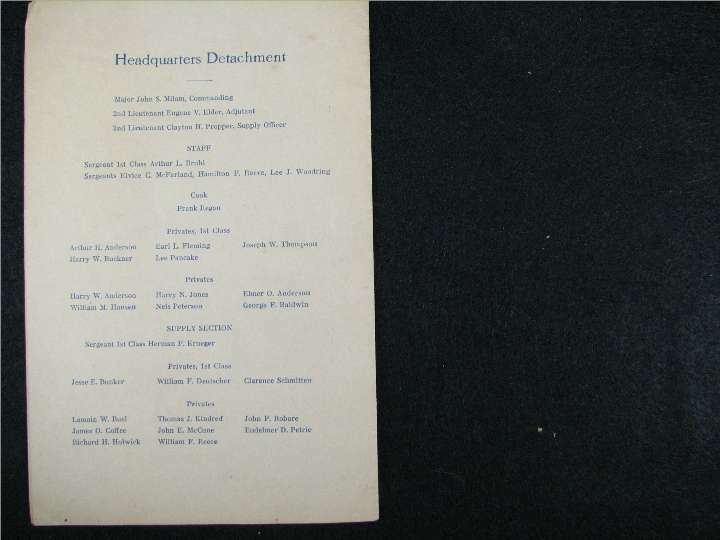 1901 MEMORIAL SERVICE, PRESIDENT McKINLEY, ASSASSINATED: There is a program from the PILGRIM CONGREGATIONAL CHURCH of Chicago dated September 14, 1901. 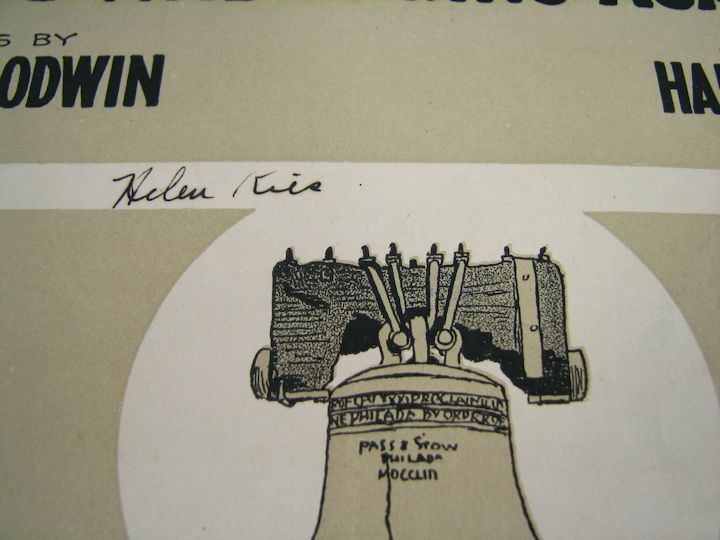 It was from a Memorial Service held for the assassinated President McKinley. 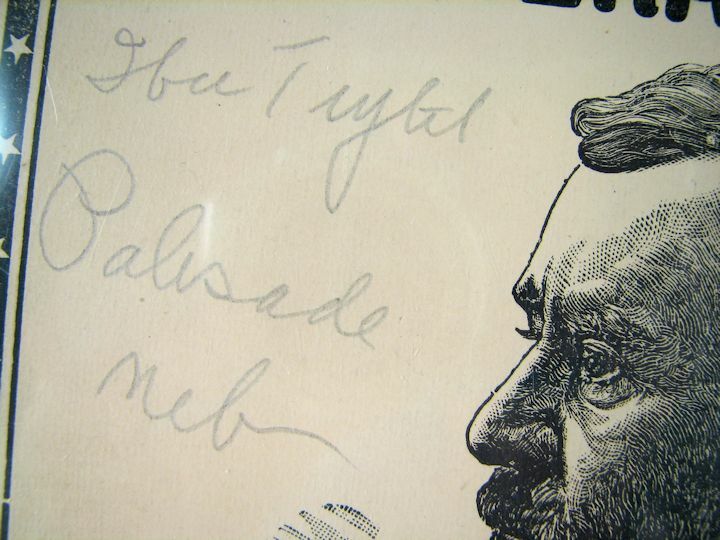 Inside there is a message from the new President Teddy Roosevelt. 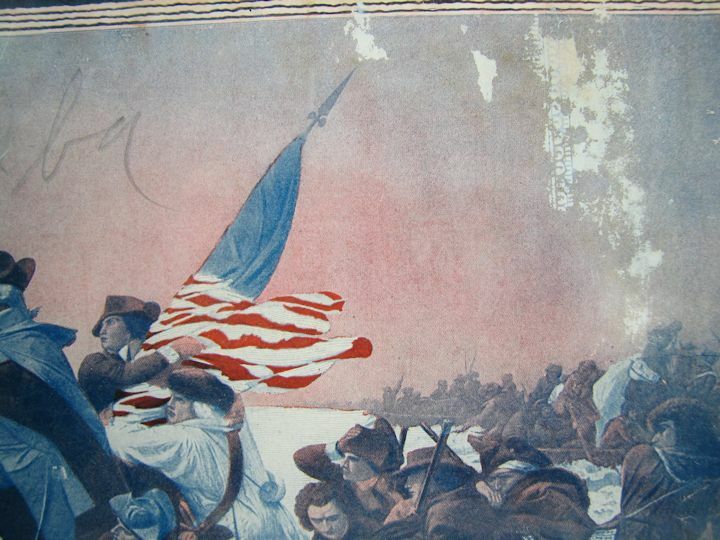 In addition to this program there is an image of McKinley; an image of Roosevelt; newspaper clippings of McKinley's home, a chronological listing of McKinley's life and an article saying that Roosevelt will become president if McKinley does not survive his wounds. 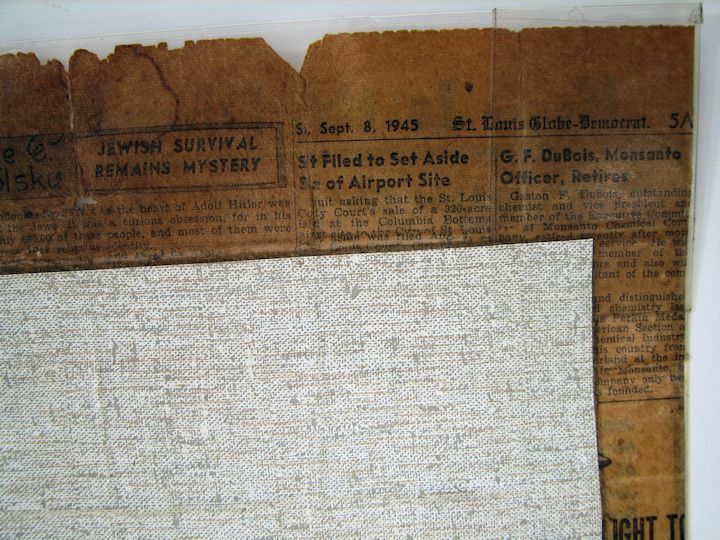 The newspaper clippings are separated at the folds. 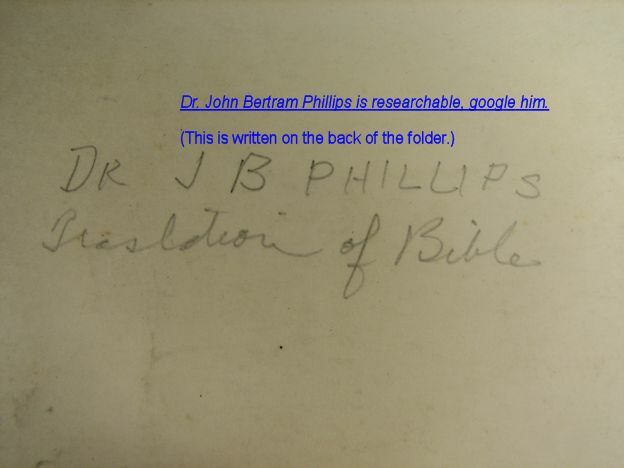 I don't believe the Doctor and the folder are related....just a place to write his name as a note. 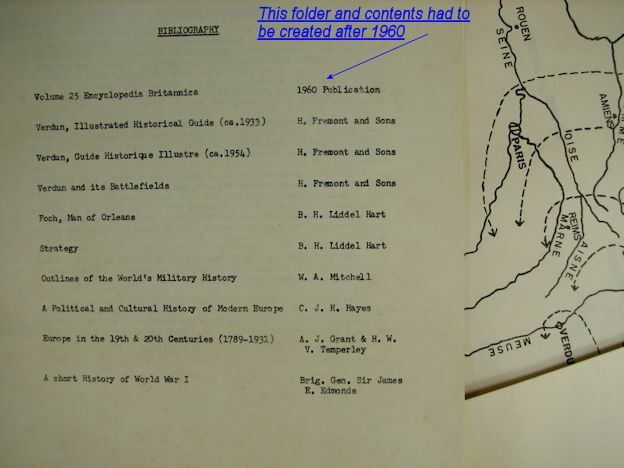 The last page of the contents are sources of the data used and one is dated 1960 so, I believe this folder will date after 1960.